I love the Delta Airlines ad that says “Good things don’t come to those who wait. They come to those who go out and find them.” That’s what we decided to do this summer. Make a dream come true. 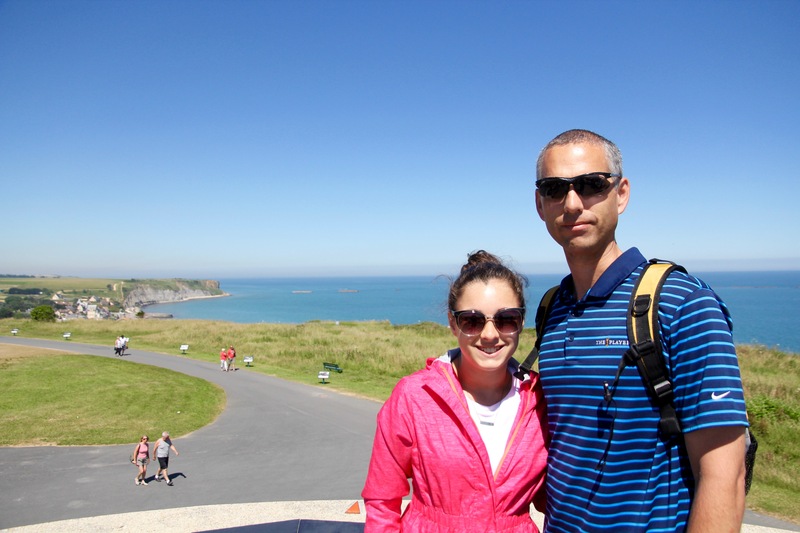 Doug, Eliza, and I just returned from a trip to Paris and northern France. 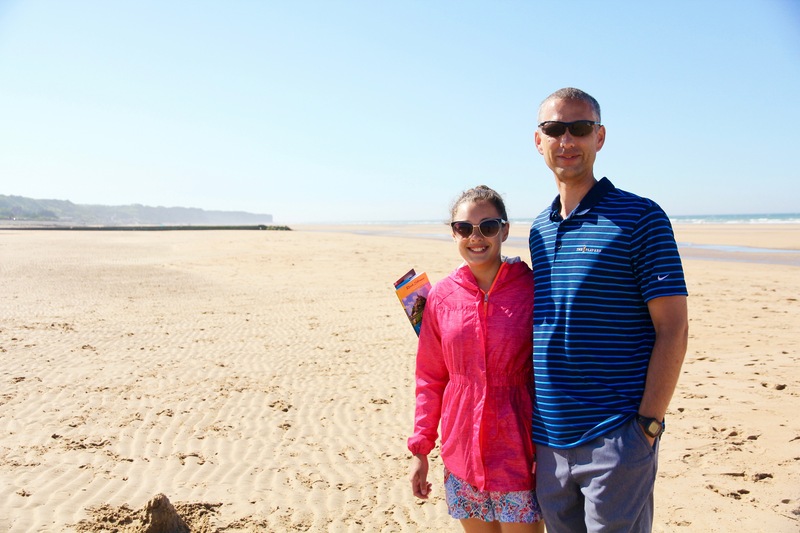 How this adventure came to be is a story for my next post, but for this post, I wanted to focus on our time in Normandy, and the incredible experience it was to visit many of the D-Day sites. 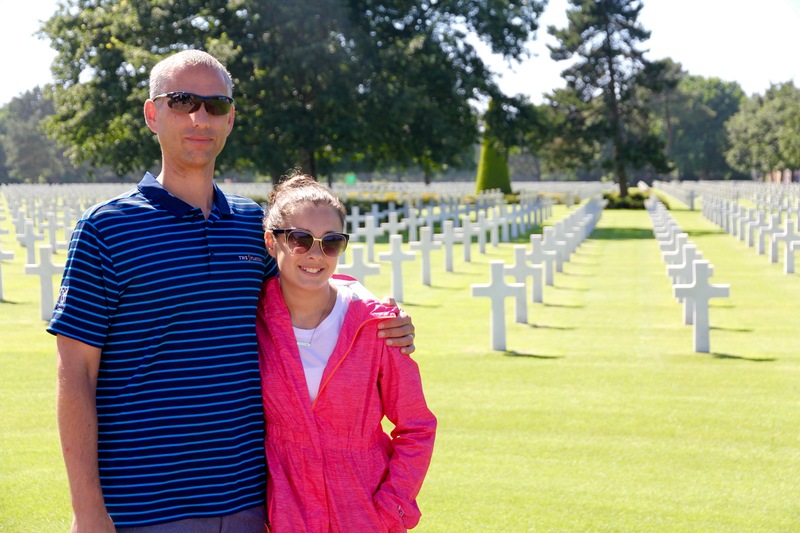 We learned all we could about WWII and stood on sacred ground that sobered us to the core. At the same time, we were charmed by the small surrounding towns that still celebrate their precious liberty. They value this freedom born of so much sacrifice. 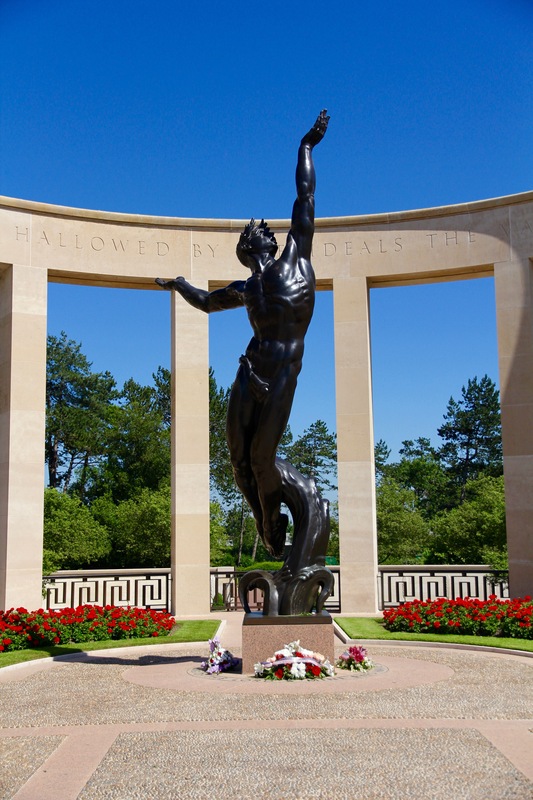 They have not forgotten each small but significant victory that eventually led Allied forces to liberate France the summer of 1944. 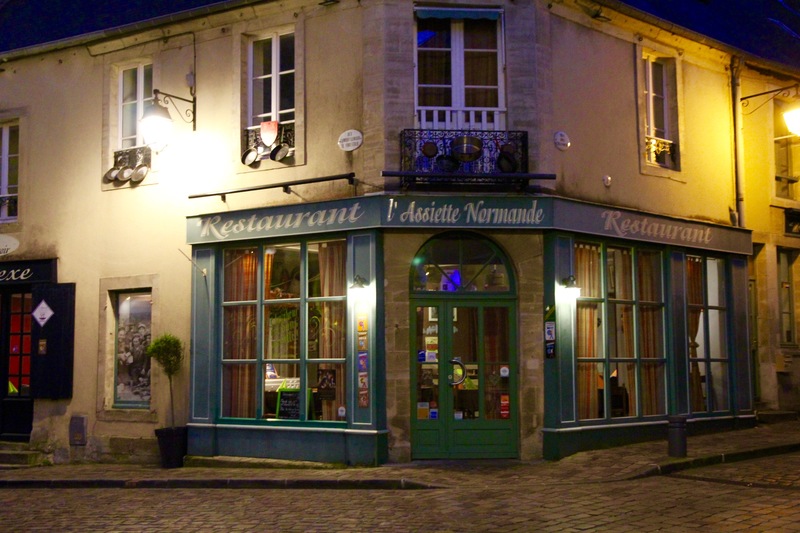 After 6 days touring Paris, we drove north to Normandy. I know, I’m beginning with the end. But with all the 4th of July celebrations, and Utah’s commemoration of religious freedom this week, I feel the need to start here with my storytelling. 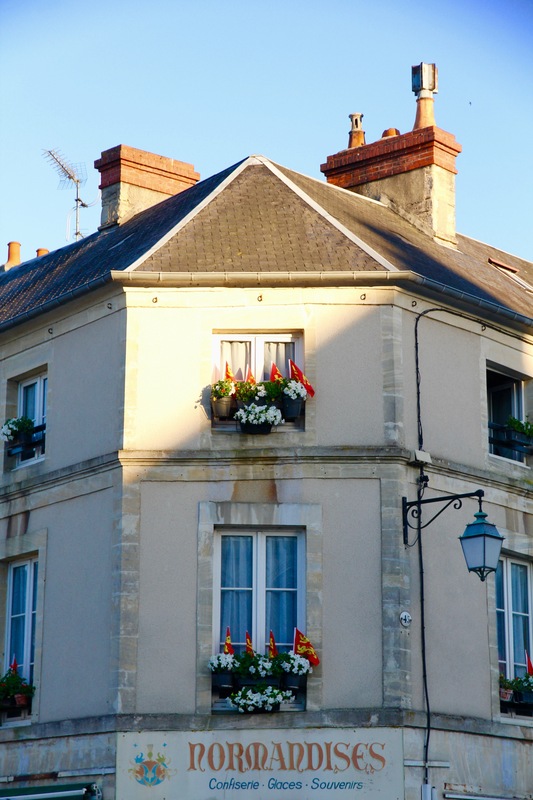 In the quiet town of Bayeux, France. 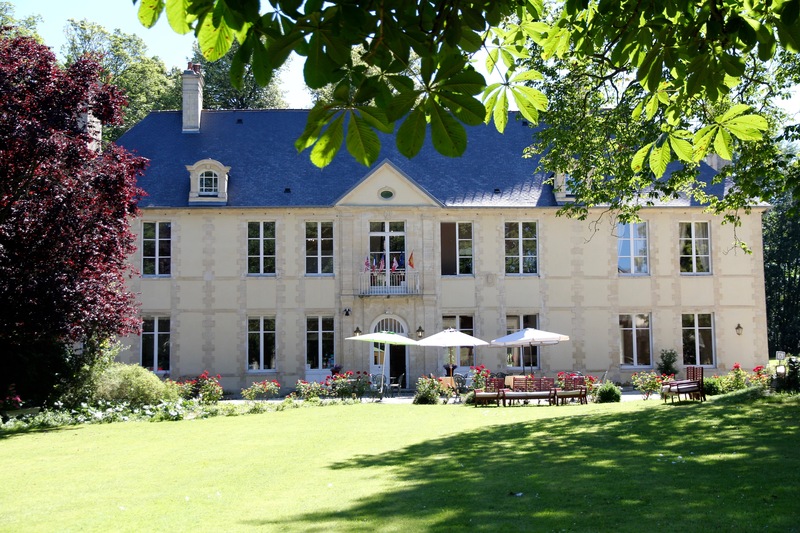 This is the beautiful Château de Bellefontaine. 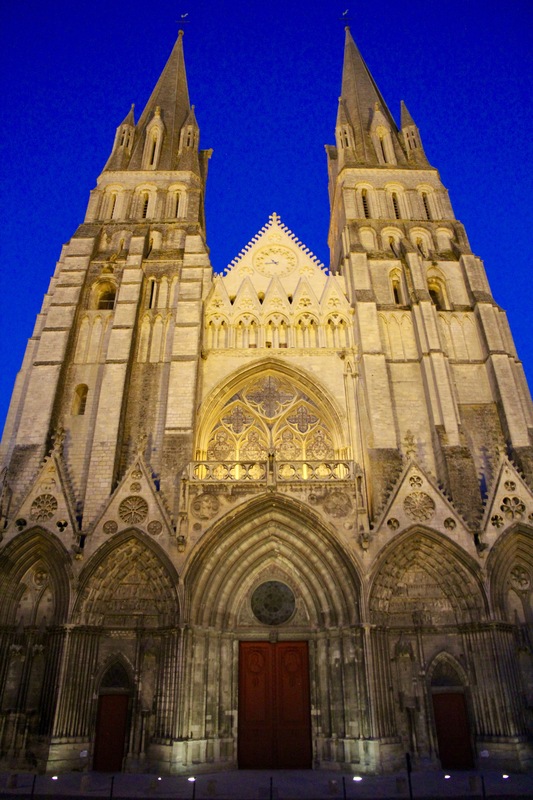 You can find it just outside the city center of Bayeux. We stayed here and thought it was absolutely delightful. 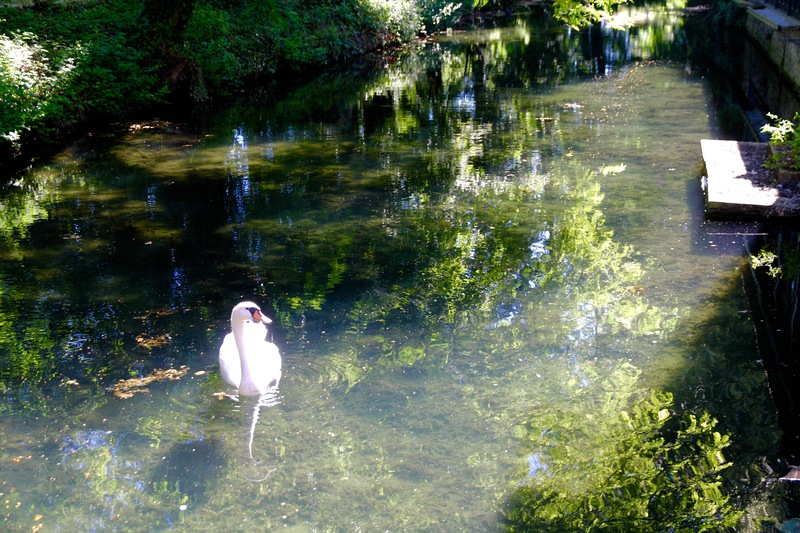 I took dozens of photos (sprinkled throughout this post). 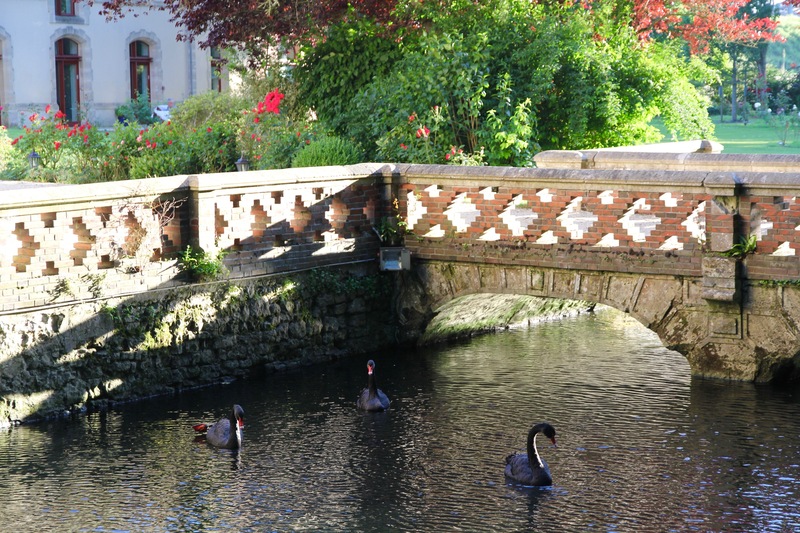 From the swans in the river to the rose gardens in full bloom, this 18th century château had us feeling like we were in a Victorian novel. 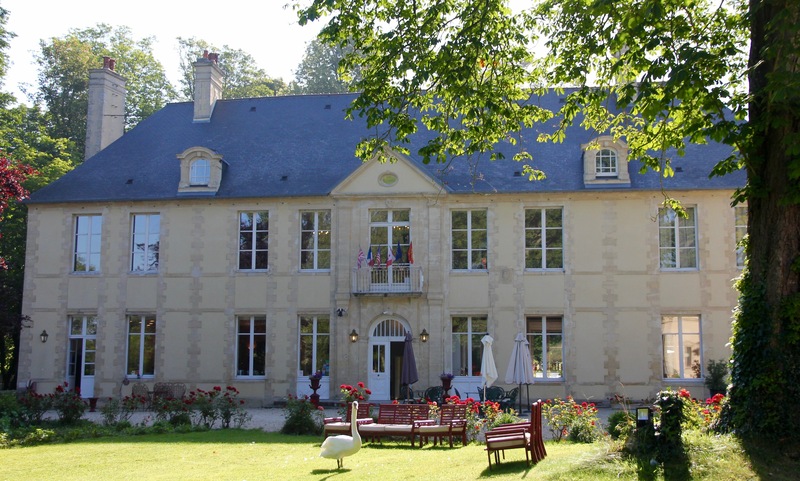 Originally the chateau was a manor house, marked by the history of William the Conqueror. 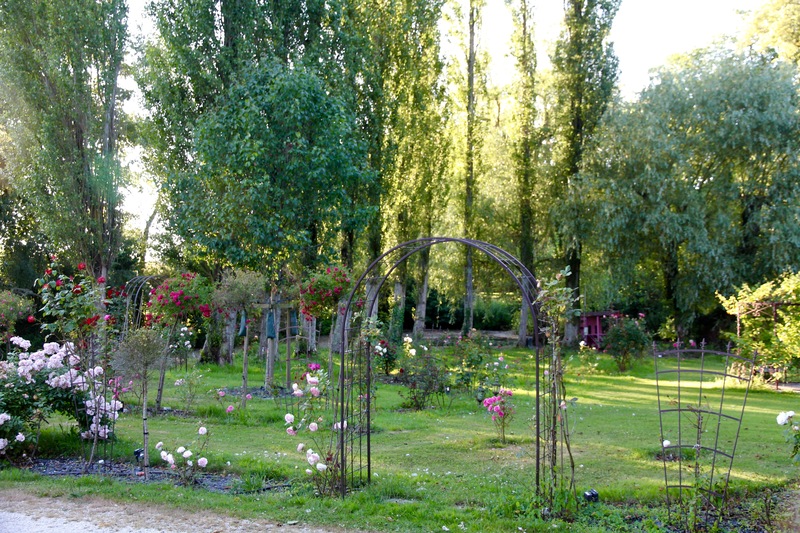 Today the estate is open to visitors looking for lodging, parties, or weddings. 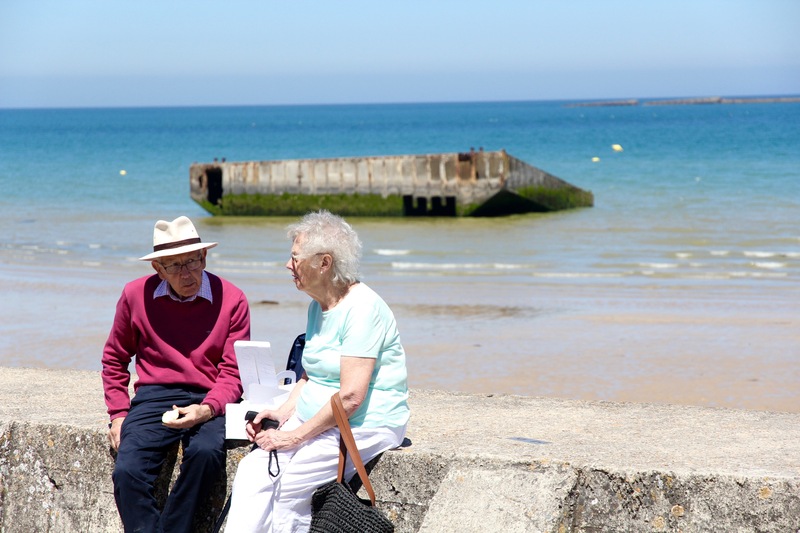 After arriving in Bayeux in the early morning, we ate pastries from a local boulangerie then drove to our first D-Day site, the town of Arromanches. 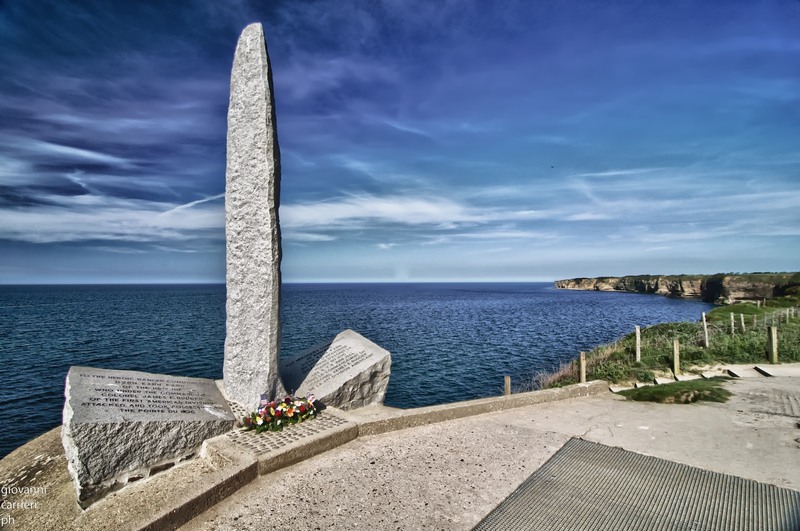 While driving along I read aloud about this period of WWII and the 25,000 lives lost during the Invasion of Normandy. I suddenly had to stop reading for the emotion balled up in my throat. Before we even stepped out of the car, an immense gratitude rose inside me, and with it, an appreciation I haven’t felt before. 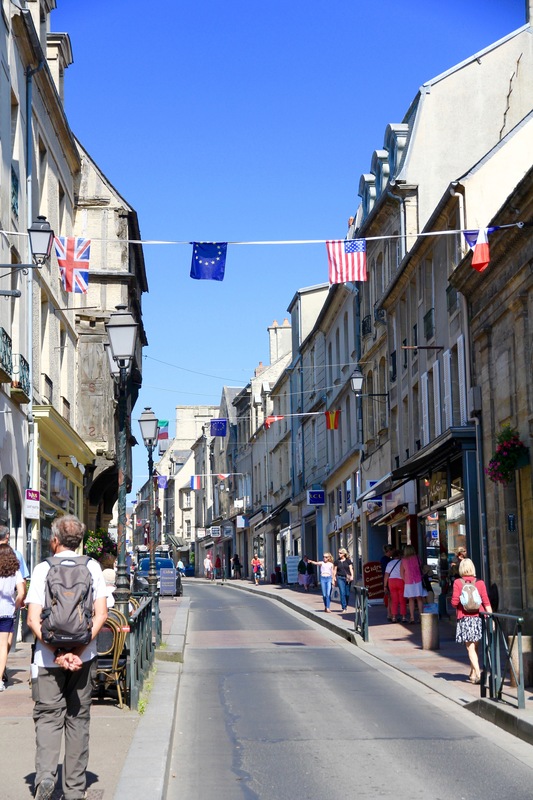 Town of Bayeux – Allied flags still flying. The motto of the French Republic is Liberté — Egalité — Fraternité. 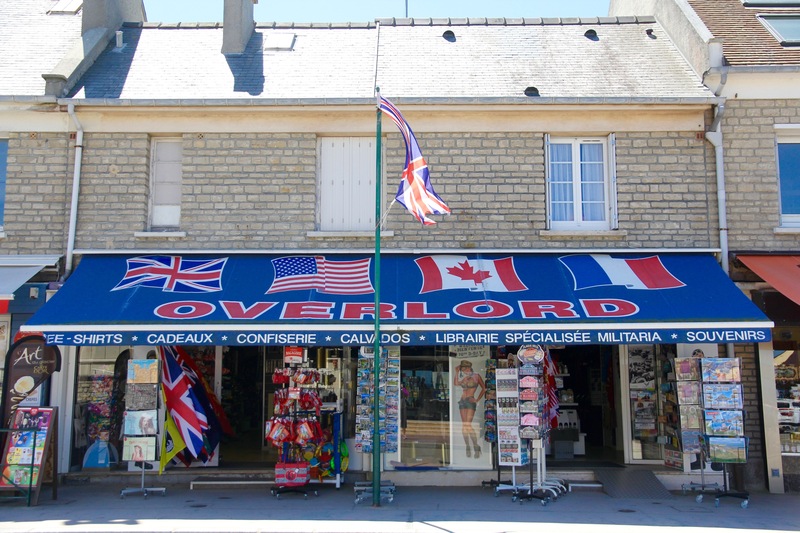 All throughout Normandy, buildings, homes and shops still fly Allied flags. 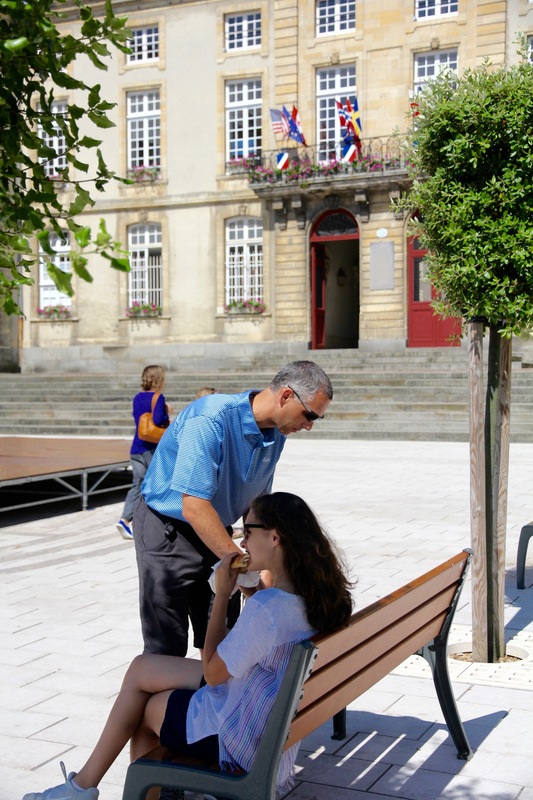 A token of thanks for their cherished liberté. That was astonishing to me. 75 years have gone by and Americans are still received with warmth and kindness here. These sleepy towns remain humble and thankful for their liberation. The entire day I thought about liberty as a God-Given gift which men and women from so many nations have given all to defend. 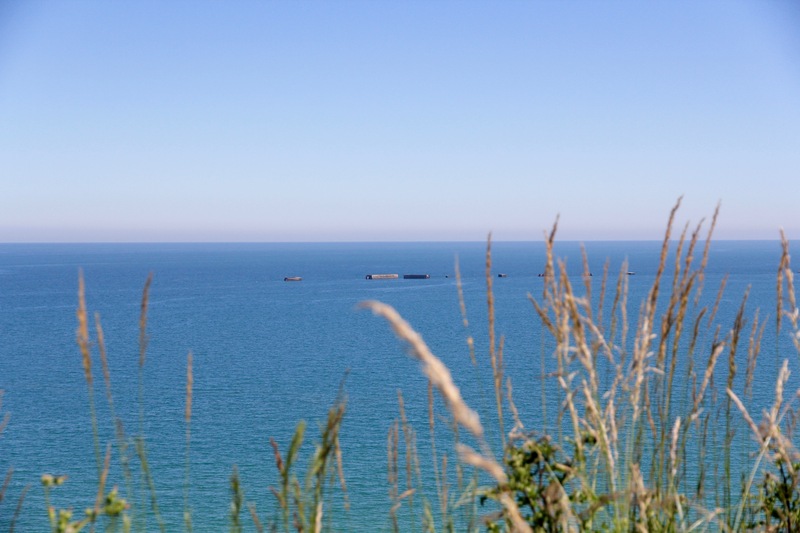 From the bluff above Arromanches you can see the remains of Port Winston. Named after Churchill, this make-shift port was his brainchild. 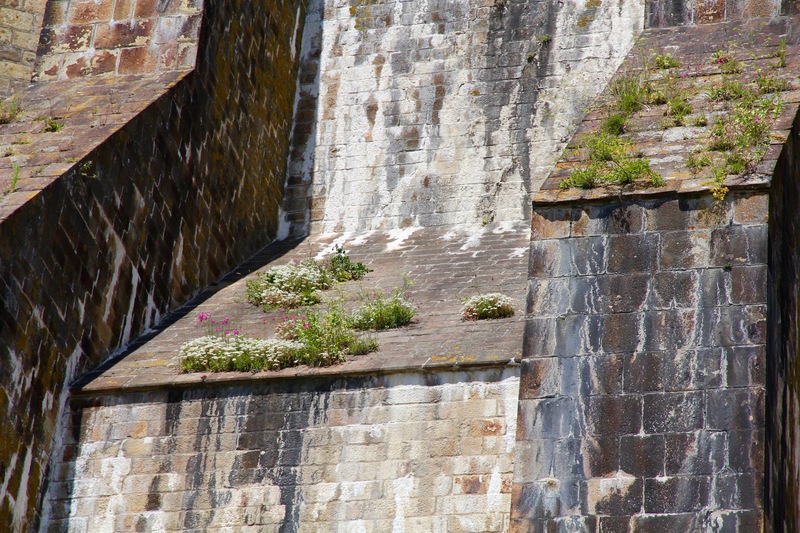 The port was created during the invasion to form a gigantic seawall and secure an air/water space the size of Dover. The port allowed for supplies and vehicles to be brought in, a must-have after the beaches were secured. 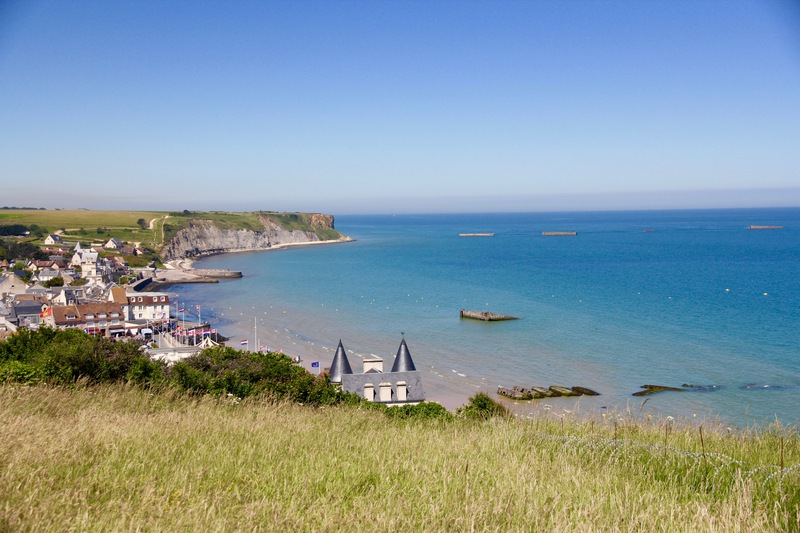 View of Port Winston and Arromanches. Allied forces sunk ships bow to stern, to form a semi-circular barrier, then hauled enormous cement pontoons up the English Channel to fill out the rest of the seawall. Each pontoon was the size of a football field. You can still see remains of the pontoons above and below. This was an incredible feat that came together in a number of days. Building Port Winston was crucial to Allied success as they desperately needed calm waters where boats and planes could land. More remains of the port seen in the water. 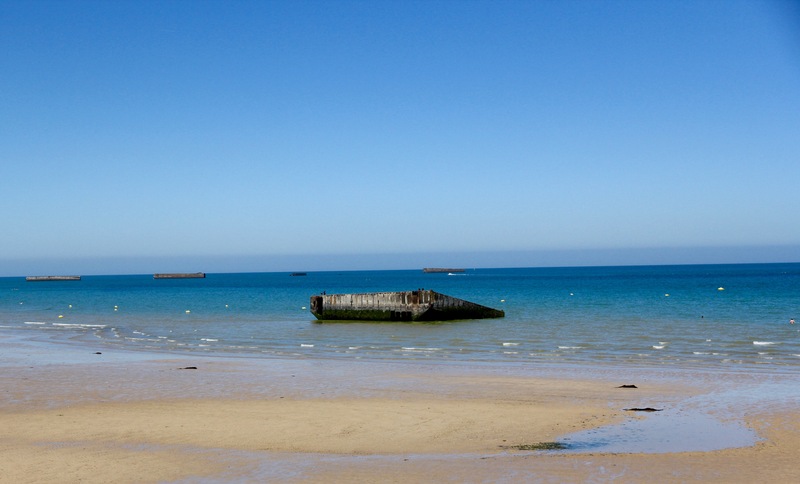 Town of Arromanches. Remains of Port Winston. 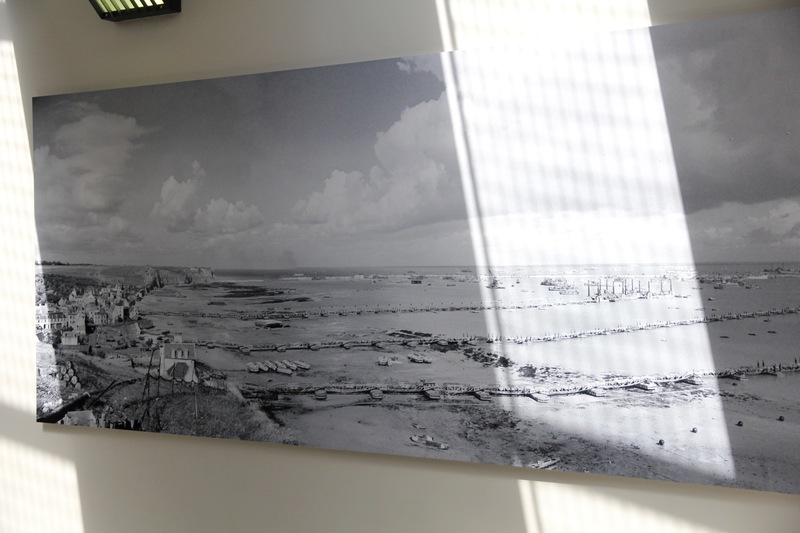 In the museum above Arromanches you can find this large, blown-up photo of how Port Winston looked in 1944. I watched this older couple for a few minutes. They were so gentle with each other, I zoomed in on their faces while also capturing refuse of the Port behind. 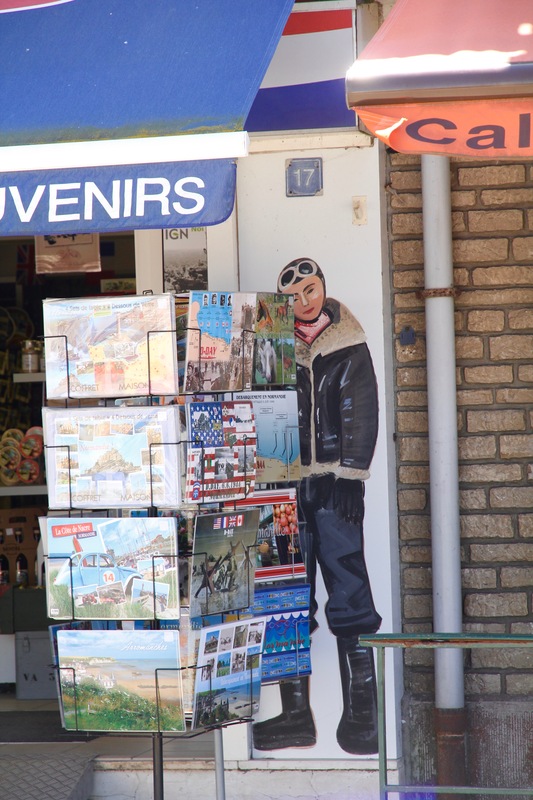 I loved the vintage images of women in bomber jackets and flight gear. From the Overlord Store we could look up the hill to see an old German tank. Can you find it? 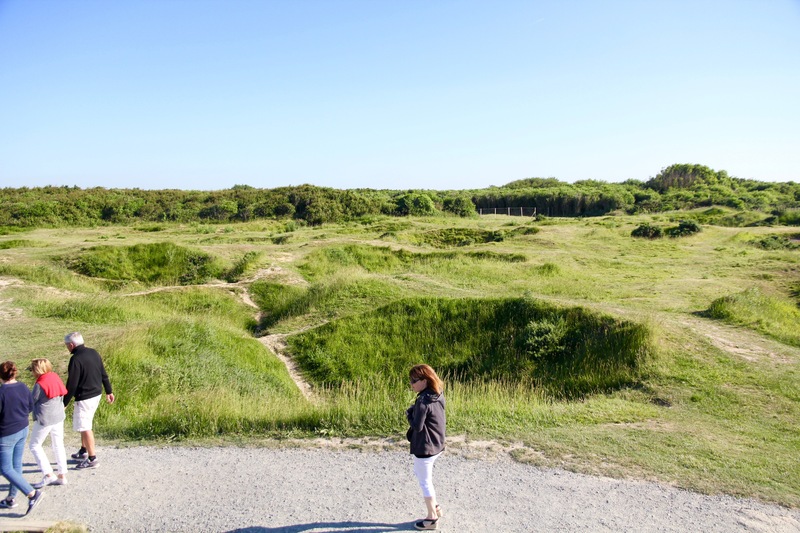 Our next stop was Longues Sur Mer. A camouflaged German gunning station with four large gun batteries that could shoot missiles up to 12 miles away. Crazy ability if they had accurate intel and coordinates. Each gunning station would be run by about 14 men. You can see the size here, Doug standing next to a gun. 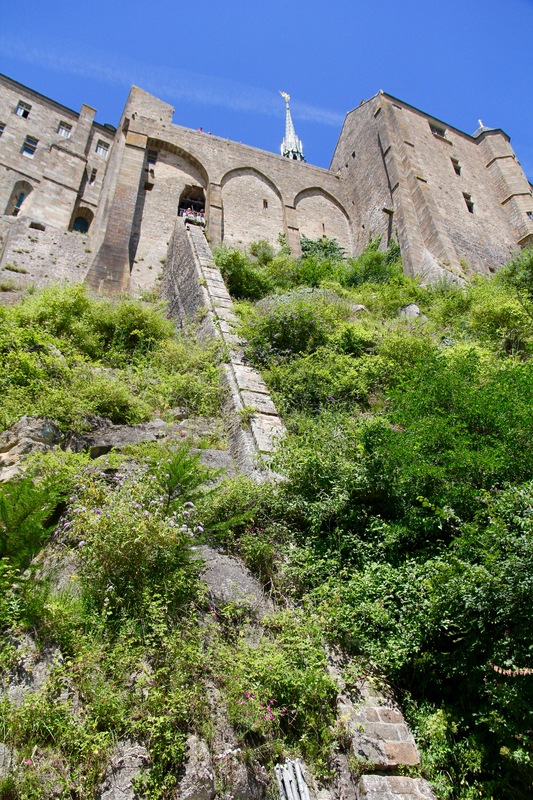 From this perspective you can see all four battlements. They were about 300 yards inland and would have been covered with greenery or flora to disguise them from airplanes. 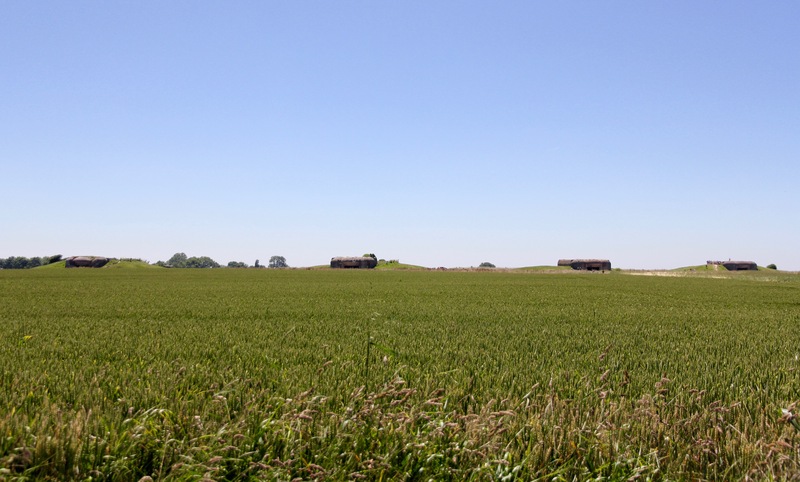 From where we were standing here, a scouting station that had a fair view of the waters could send information back to the gunners via a phone line buried underground. 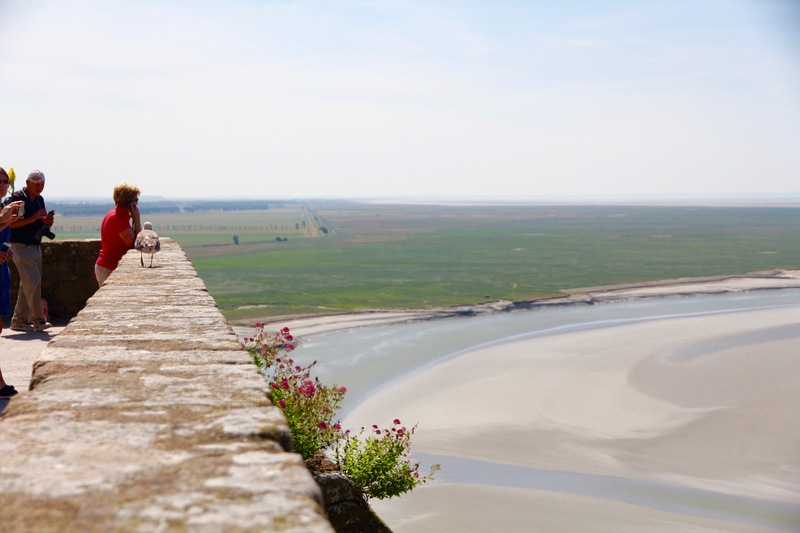 This is the scout overlook for Longues Sur Mer. You can see the ocean in the background. Note how a grown man could not stand upright on this level, but the underground area had room to stand and sleep. Incredible how much time the Germans spent digging in to Normandy. They had commandeered shops, homes, and people to do their work and they were building to stay. 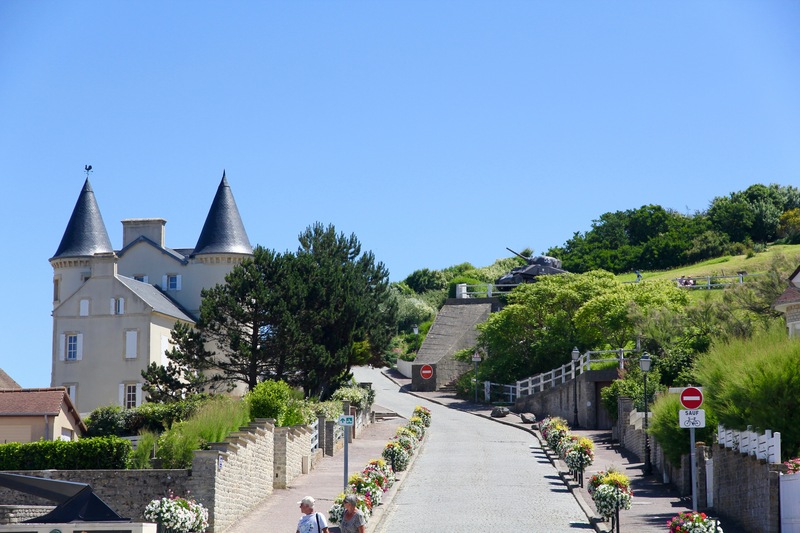 Next, we drove a little further along the coast to the American Cemetery in Colleville Sur Mer. Of all our stops, this place was the most well-kept. 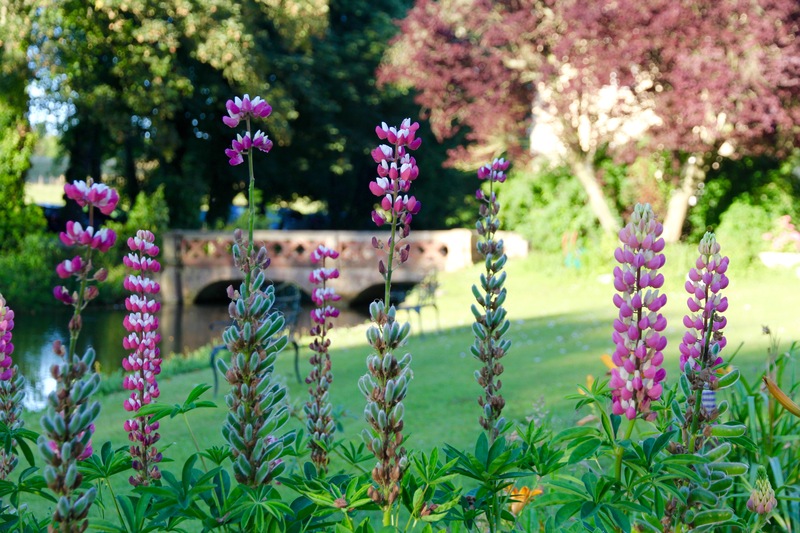 The grounds were impeccable, not a blade of grass out of place. 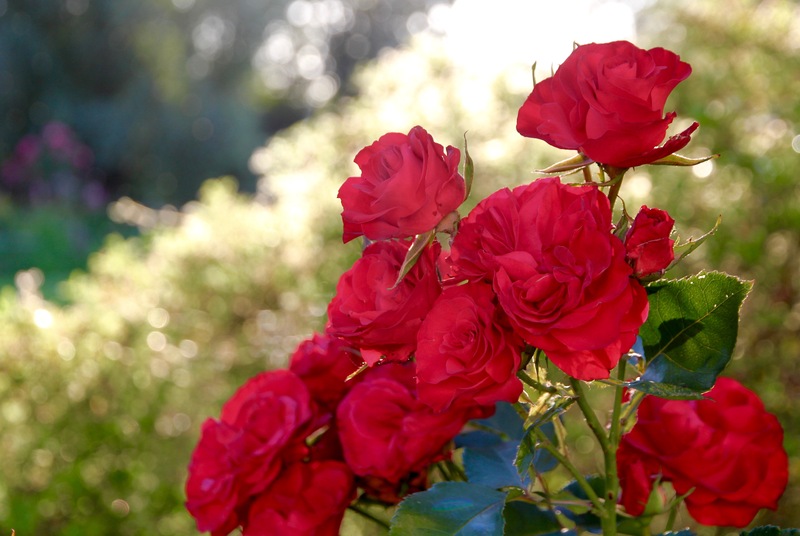 Everything was crisp, clean and beautified. 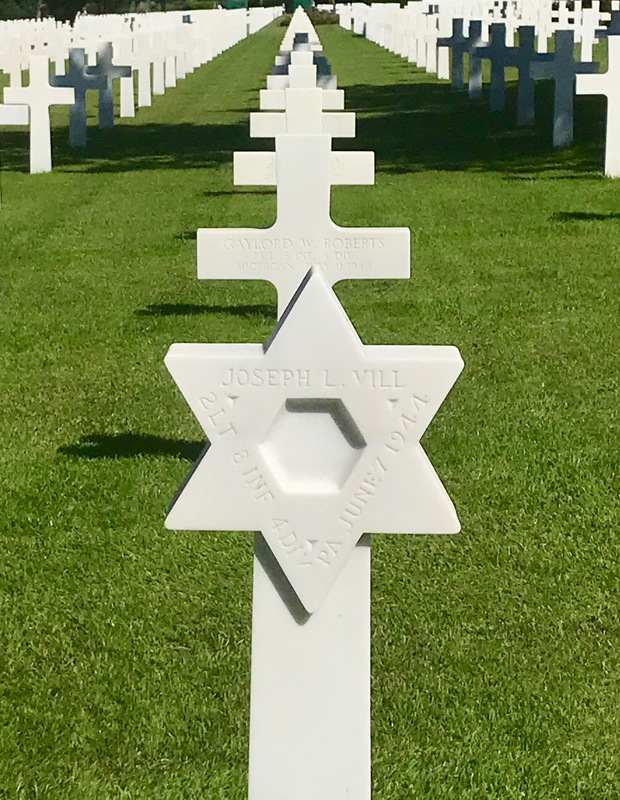 We could not get over the tidy rows of headstones, each one in perfect alignment, horizontally and vertically – a first step in a redemption for each life buried beneath those whited crosses. I immediately noticed the Stars of David, proudly holding their rightful place next to the crosses. Jews also died here in Normandy. At their own choice to serve. 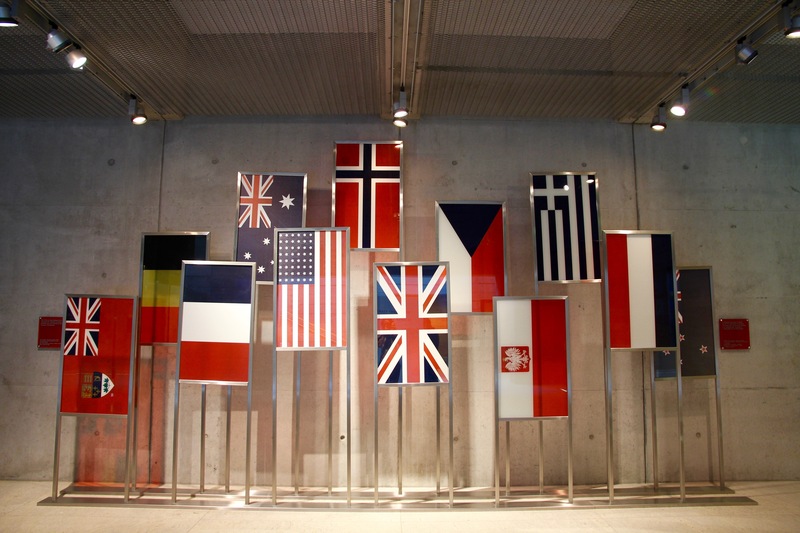 While their brothers and sisters of Europe were slaughtered in concentration camps. Every step. Every grave. It was stunning on every level. 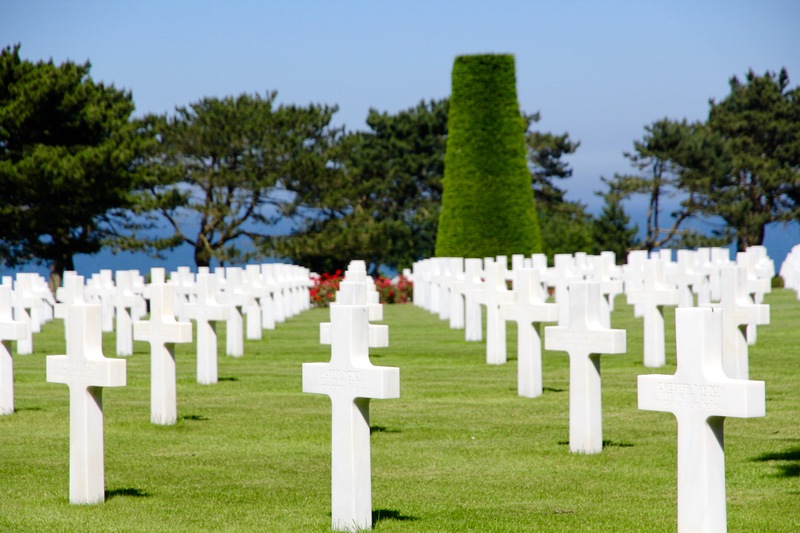 9,386 of the 25,000 lives lost in Normandy are buried here. 1800 were killed and their bodies never found. It was important to Doug to walk past all the graves in the cemetery. Because of rain, we were unable to walk on the grass, but out of honor for each life, Doug made his way along every path, past each grave. His hand figuratively over his heart, a prayer of gratitude on his breath. 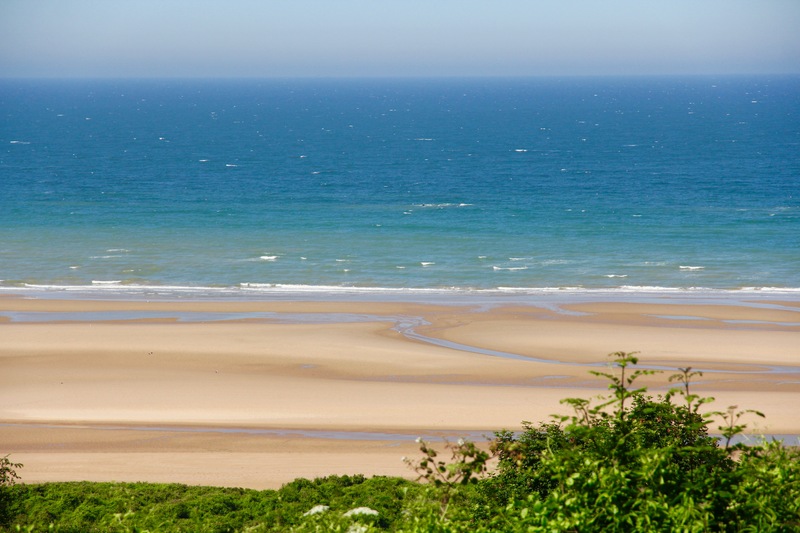 A quiet and peaceful Omaha beach. 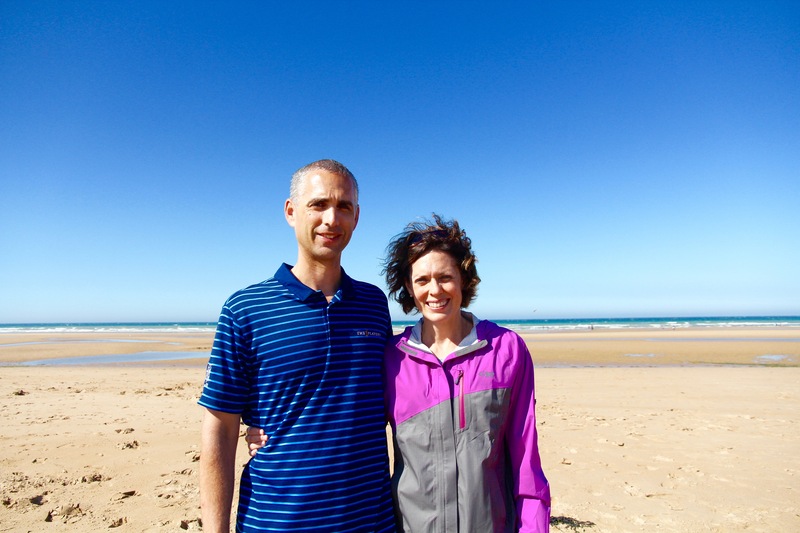 Eliza’s feet were tired so she and I stopped to rest and look out over Omaha Beach while Doug walked. On the hour, taps was played from the portico end of the cemetery and Doug caught part of it on video. This statue is called “The Spirit of American Youth Rising from the Waves.” I studied it for a while and found it very moving. To me it looked as if God was pulling this young man up and out of the terror by one hand, his other hand reaching out to his fellow soldiers, while a lick of water claimed his body. I also can’t imagine being the daughter, wife, or mother of one of these men, sending them off into such chaos and horror, wondering if that goodbye hug was the last. I was in tears considering it all. I will never be the same after standing here. 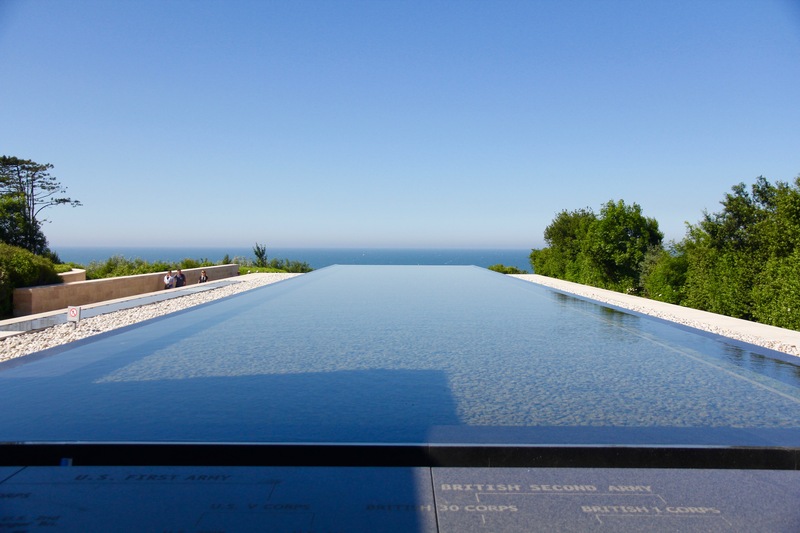 Infinity Pool just outside the museum. 38 pairs of brothers are lying next to each other, along with one father and son. I thought of my own boys. Some families lost four, even five sons during the war. We read their names and saw their photographs in the museum. I asked Eliza if it was hard to look at so many black and white photos, see all these sites, and feel the impact of what happened. I wondered if it took place so long ago she couldn’t feel a connection. And she said yes. So we talked for a while about how it would be easy to disconnect from this, to not understand how the fighting, the battles that happened here, the thousands of lives lost, ensured the freedom she enjoys today. She is free to be Mormon. Free to walk safely to the swimming pool for her swim practices. Free to go to school without fear, to choose an occupation and live out her dreams. In her defense, it is incomprehensible to walk these peaceful grounds and imagine them wrought with bloodshed and violent occupation. This was the worst war our world has known. But the longer we talked and walked, the more she realized the continuation of a free world teetered in the balance here, on these very shores. 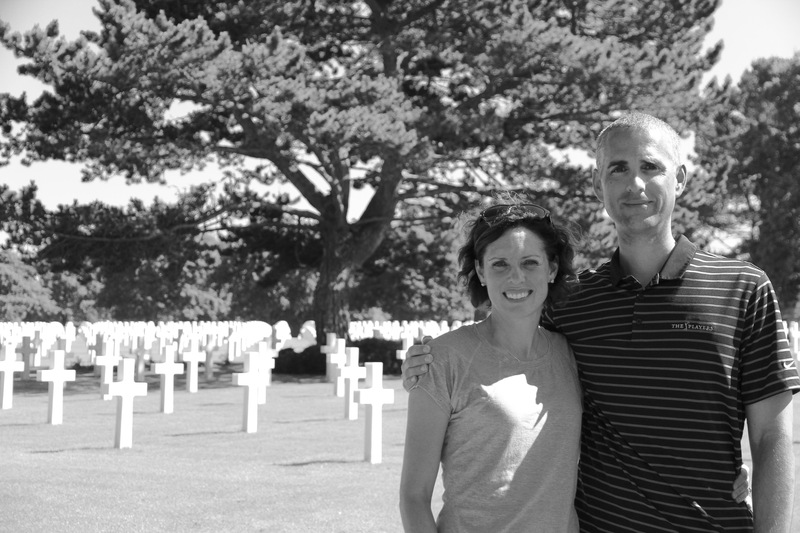 From the cemetery we made our way down to Omaha Beach, where the majority of American forces landed. 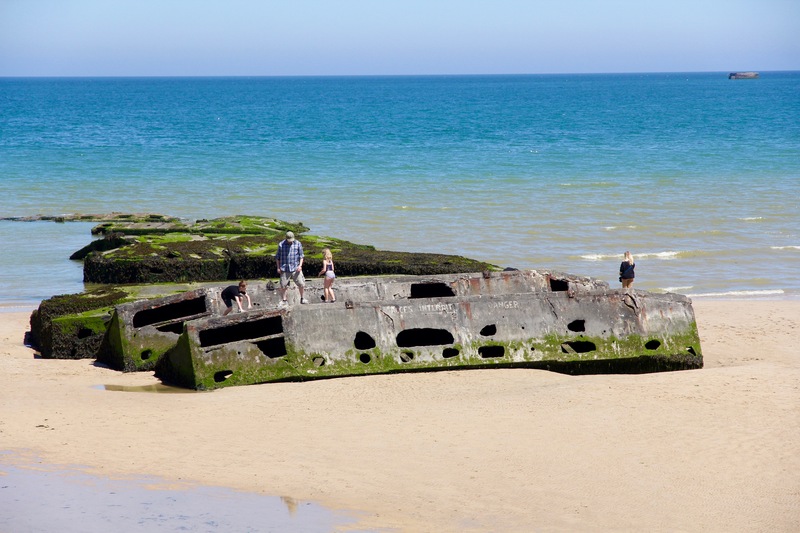 Le Braves at Omaha Beach. 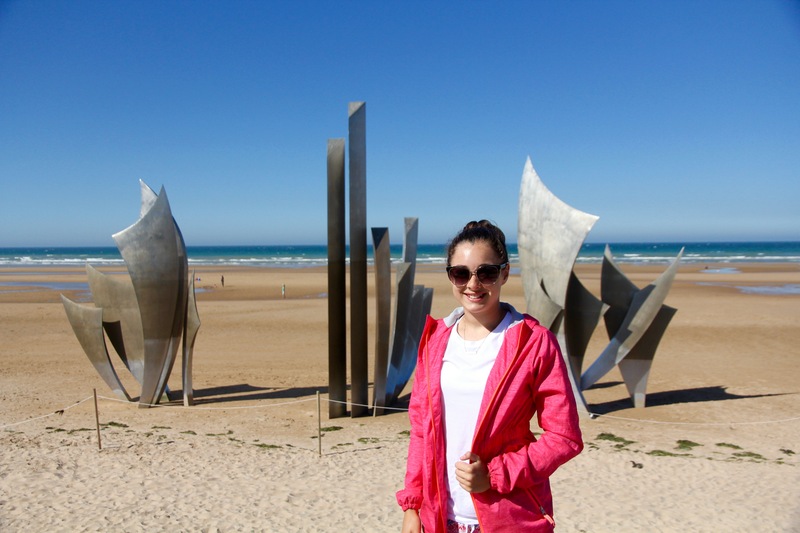 This monument, Le Braves, includes several elements: “Wings of Hope” to remind us of the brave men who landed here and our power to change the future. “Rise Freedom” to help us remember our duty to rise up against barbarity. And “Wings of Fraternity” that we may never forget our responsibility to humanity. 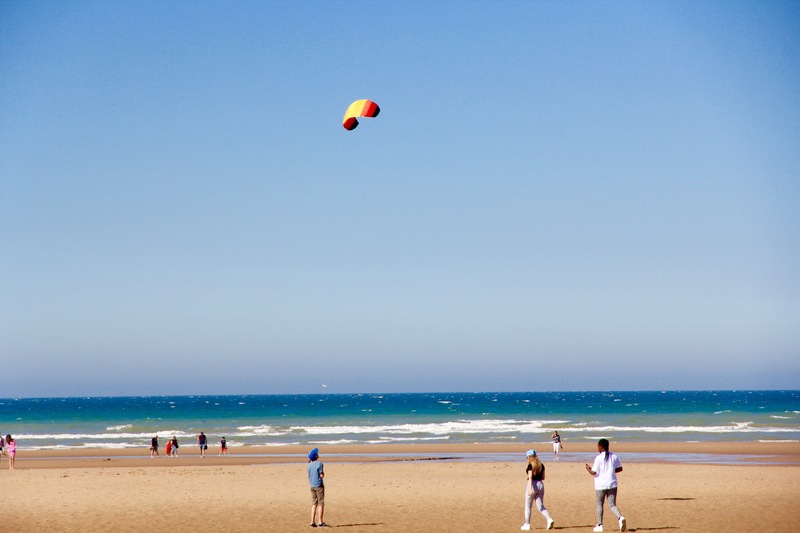 We walked past the sunbathers and kids flying kites to stand at the water’s edge. I took this photo of a diorama in the museum to show the mines, spikes, and other obstacles Germans had placed on Omaha beach to puncture, explode and deter boats and soldiers. 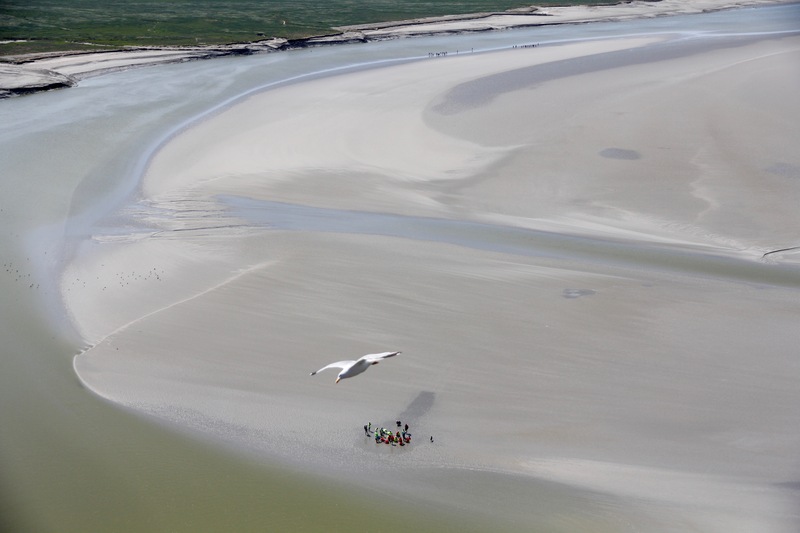 The invasion on June 6th happened at low tide in order to see and avoid these impediments. 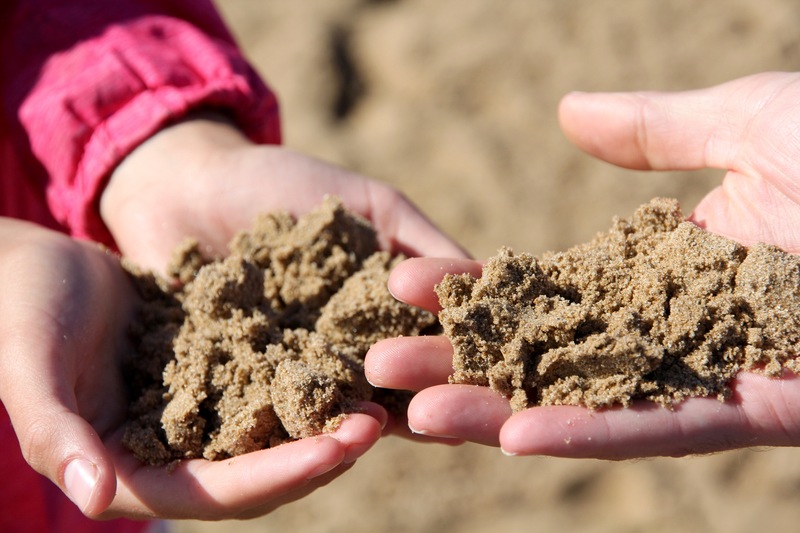 I wanted Doug and Eliza to hold the sand that held so much sacrifice. This sand once held the blood, death and horrors of that June morning, rinsed clean day after day by the rising and lowering tide. 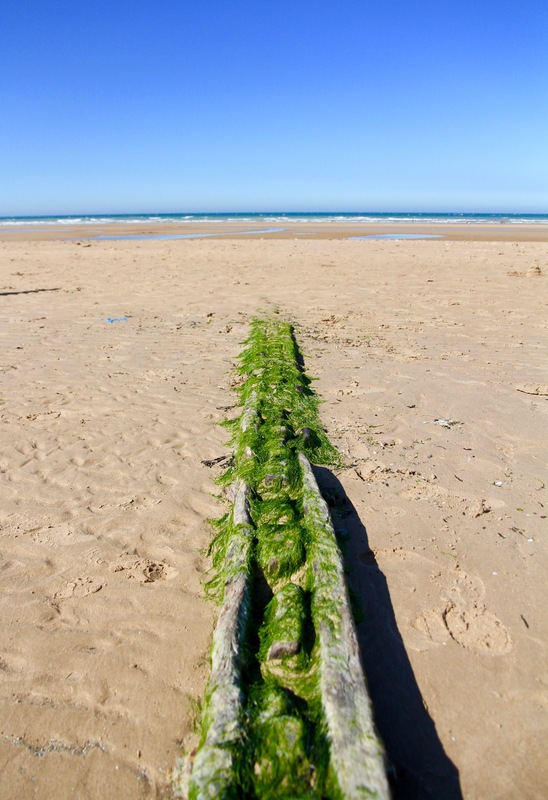 Locals say you can still find pieces of metal and other remnants from the war if you scour the beach close enough. 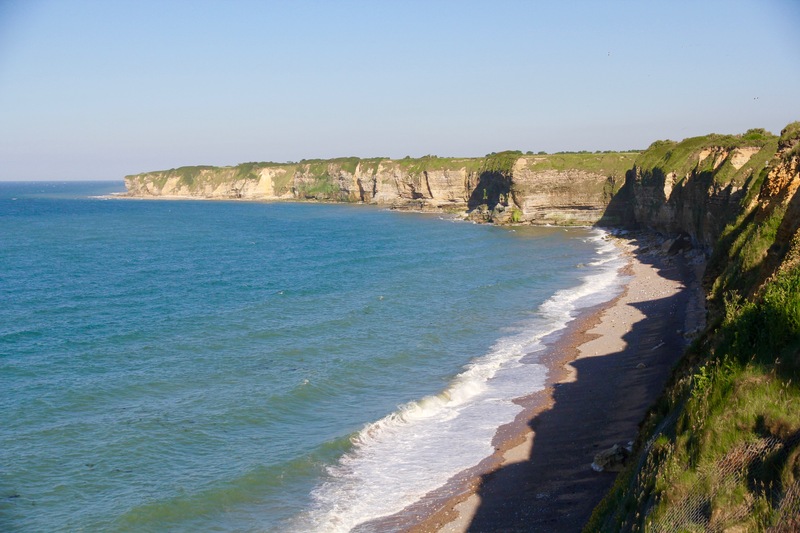 Taking Omaha Beach was the responsibility of United States Army troops. This included mine sweeping, sea transport, and a naval bombardment force. 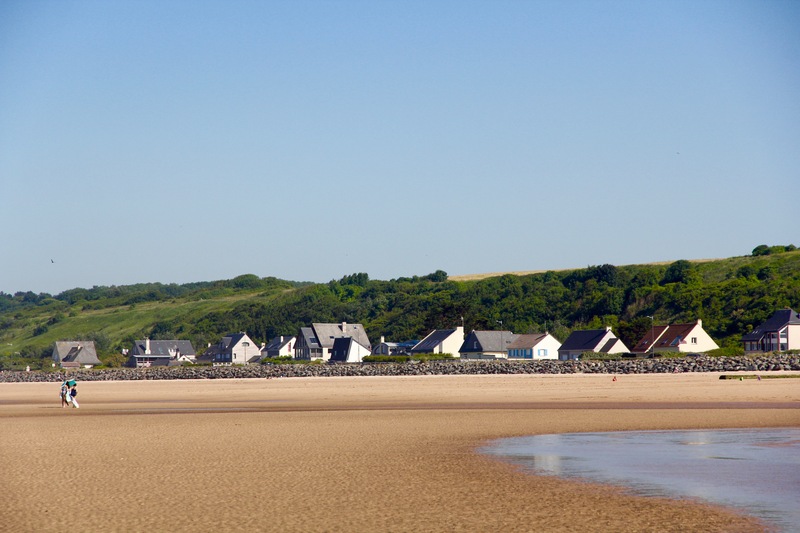 Close to 6,000 men died on Omaha Beach. Very little went as planned during the landing at Omaha. Difficulties with navigation caused many of the landing craft to miss their targets. Defenses were unexpectedly strong, leading to heavy casualties. Only 100 tons of supplies (of the 2,500 planned made it to the beach). Engineers with the job of clearing beach obstacles were pinned down for hours under heavy fire. It was imperative that American forces secure the beachhead. Disjointed and separated from their units, confused soldiers banded together and rallied each other to tackle the gunners on the bluffs. Many valiant individual actions made way for a small foothold on the beach and within 24 hours the beach was secured. 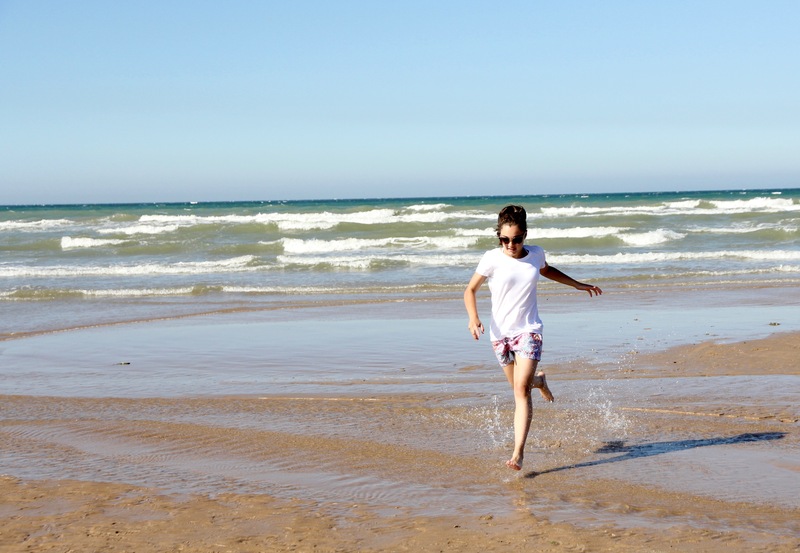 Eliza’s highlight of the day was playing in the water and running along the beach. Now when I look at these photos, I imagine the men who ran this same path, out of the waves and into a hail of bullets. 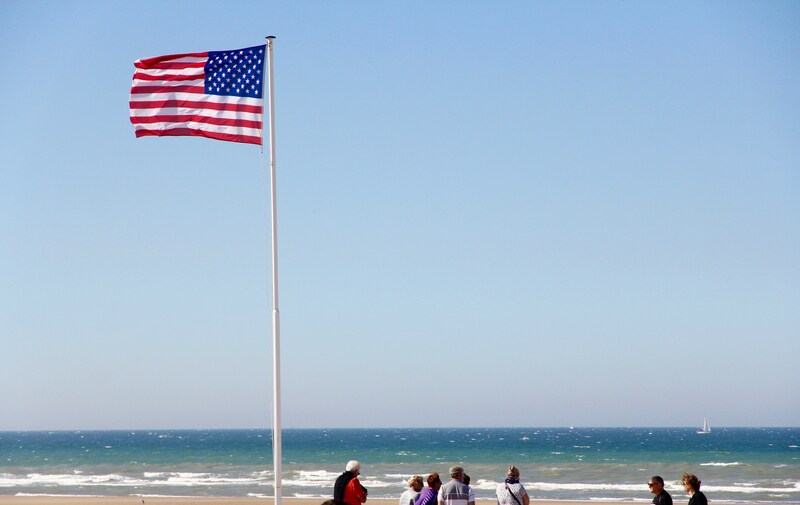 American Flag flying at Omaha beach. 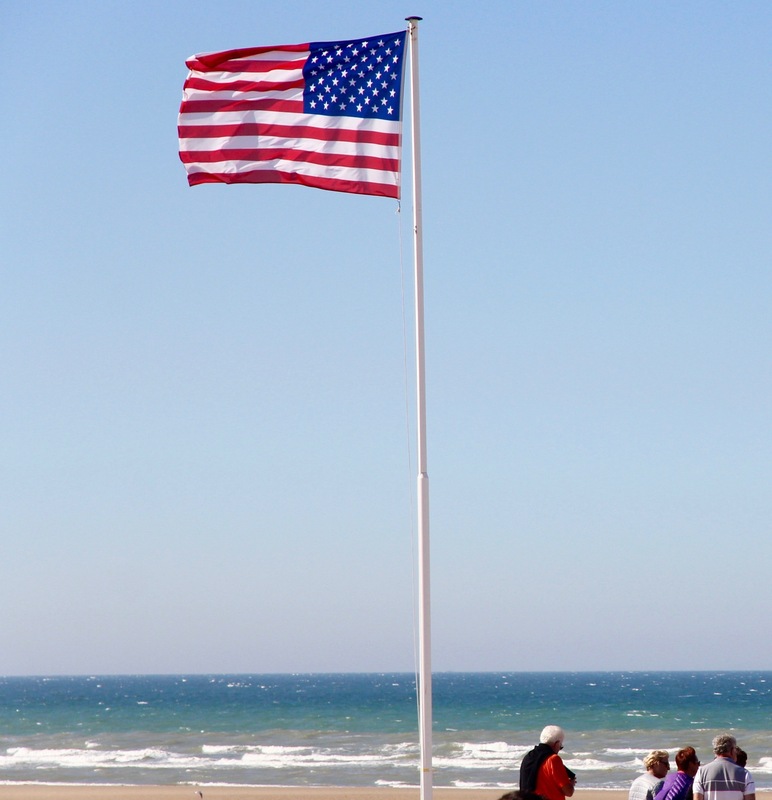 Above the beach flies a brilliant and bright American flag. I couldn’t leave Omaha without stopping to salute our colors. I stopped and took in the scene with my camera and my heart. Americans turned the tide of the war. Americans pushed the Germans back. Right here. With the kind of courage our younger generation can only try to understand. 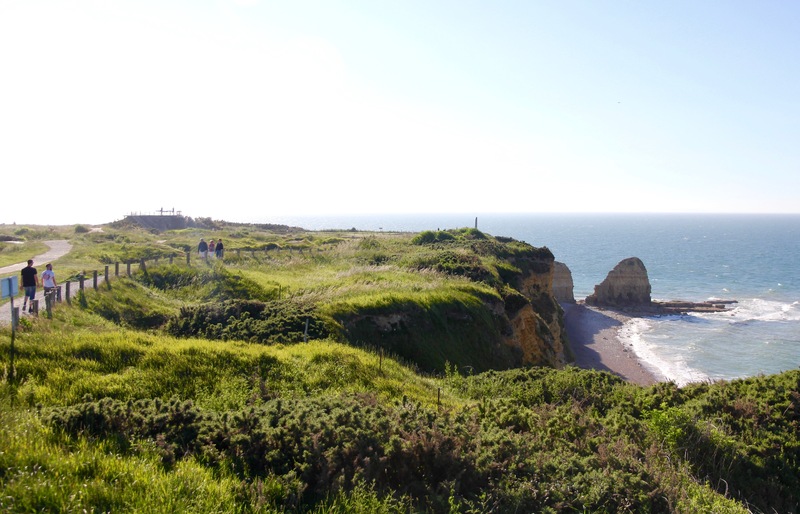 Our last stop was Pointe du Hoc, which juts out into the Atlantic like the tip of a knife. 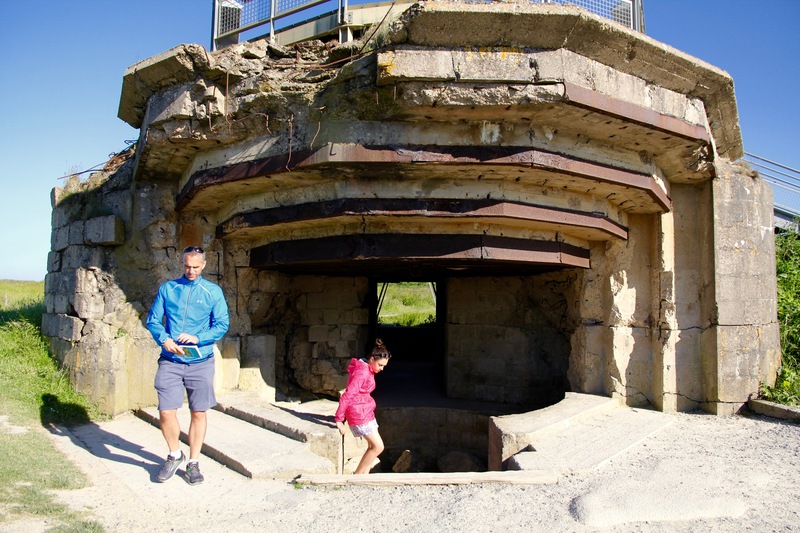 It was a serious stronghold for the Germans, with numerous gun batteries and gun nests buried into the ground. All of which were impossible to see clearly from the air. The Allieds bombed the heck out of this place. The plan was to take out these German gunners before dropping troops on the ground. This would allow for less casualties as soldiers stormed the Normandy beaches. Unfortunately, the Allies were unsuccessful in taking out the gunners on the Pointe. 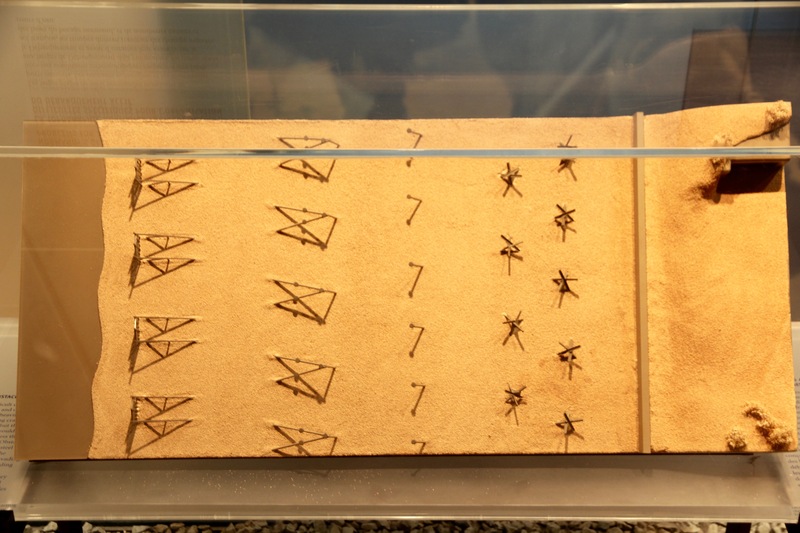 Look at how pock-marked the ground is with bomb holes. They shattered the area. Mortars landed right next to gunning stations, but missed them entirely. Because the Allied aircraft were unsuccessful in taking down the gunners before the beach invasion, a new plan had to be quickly devised. 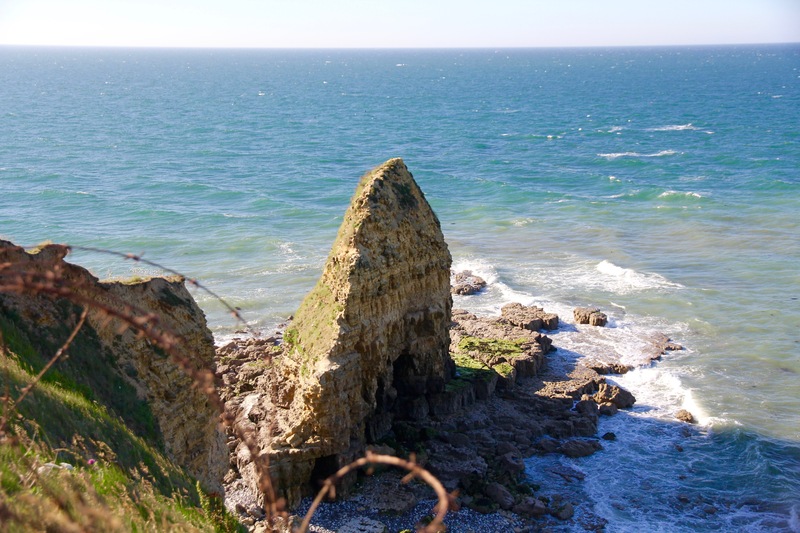 250 rangers were selected to climb the cliffs of Pointe du Hoc and take out the German gunners. 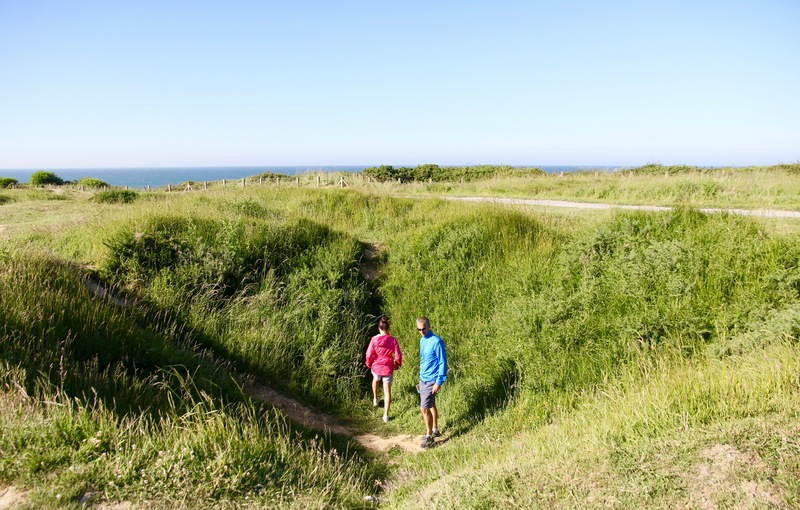 A surprise attack from ground troops was in Allied favor since the Germans had built all their gun batteries at Pointe du Hoc to face inland. 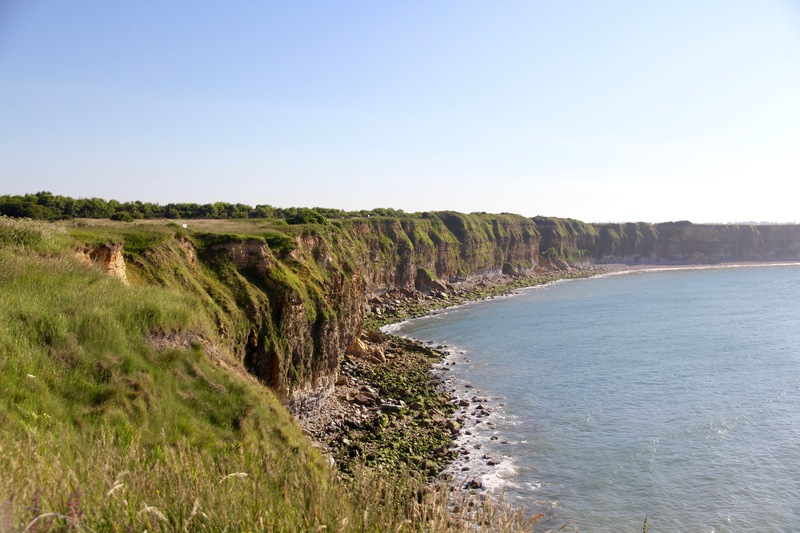 Tall, steep cliffs gave the Germans no reason to think an invasion from the shore plausible. These are the cliffs looking east. 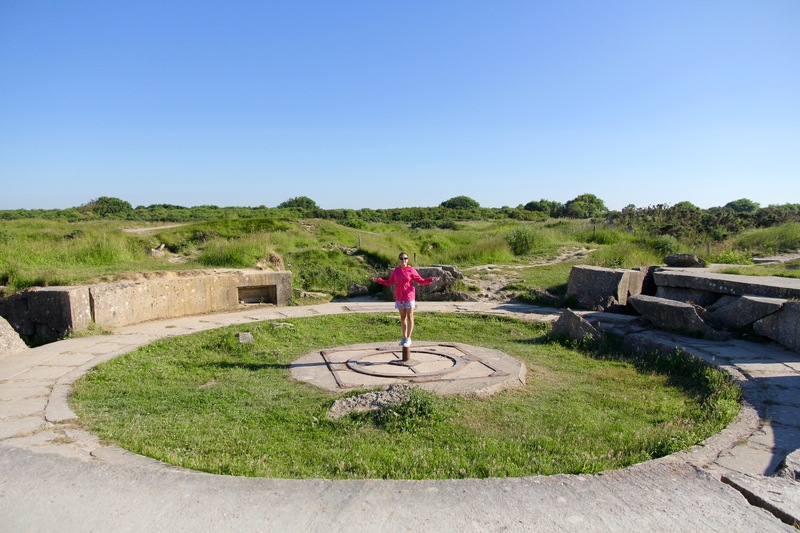 Rangers who volunteered or were chosen for this special mission used rope ladders from London fireman which they shot with rifles and grappling hooks onto the bluffs. They used knives to anchor themselves into the cliffs as they climbed. All the while enemy fire barraging them, comrades getting picked off ladders left and right. Only 90 out of the 250 chosen rangers survived the mission. 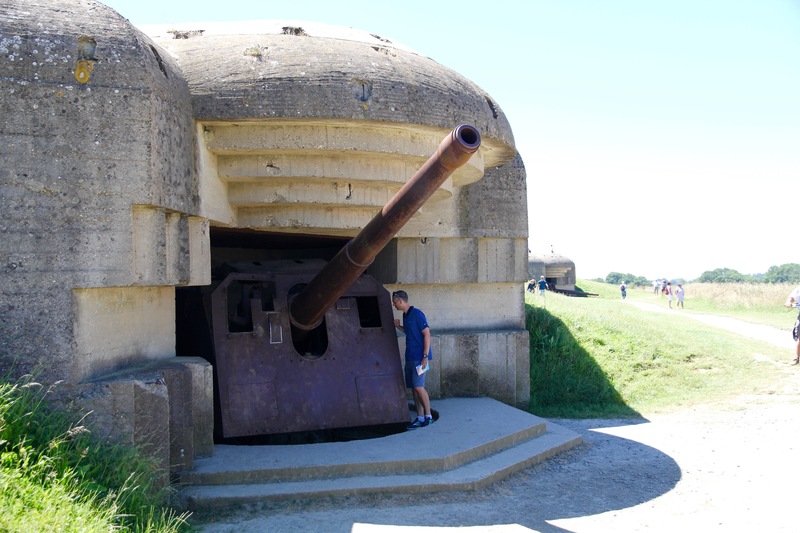 But with herculean effort and incredible courage, they somehow managed to commandeer the gun batteries, marking another pivotal turn for the Allies. One step closer to VE day. 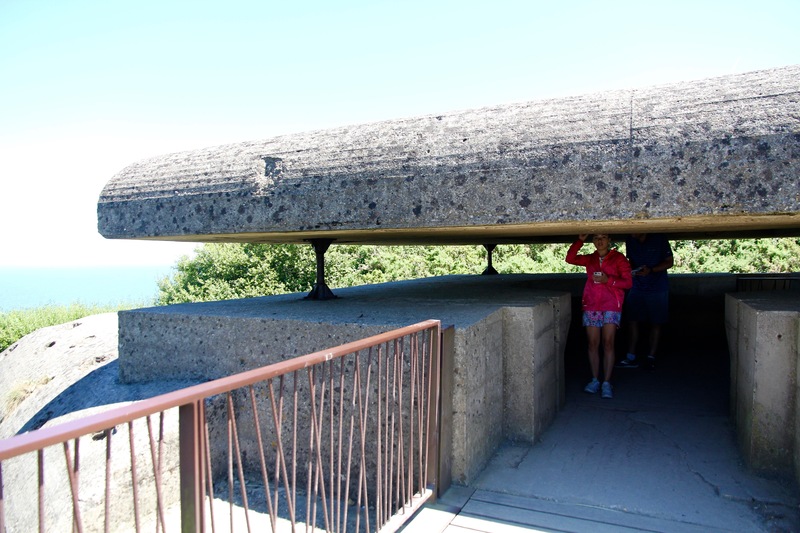 This is the actual tip at Pointe du Hoc. A very desirable vantage point. You could see miles down the shore in both directions which would allow Germans to alert gunners along the bluffs of incoming air raids, ships, or troops. The monument here was powerful. It’s a huge cement knife (taller than two men) plunged into the top of one of the gun batteries, breaking cement to the left and right. 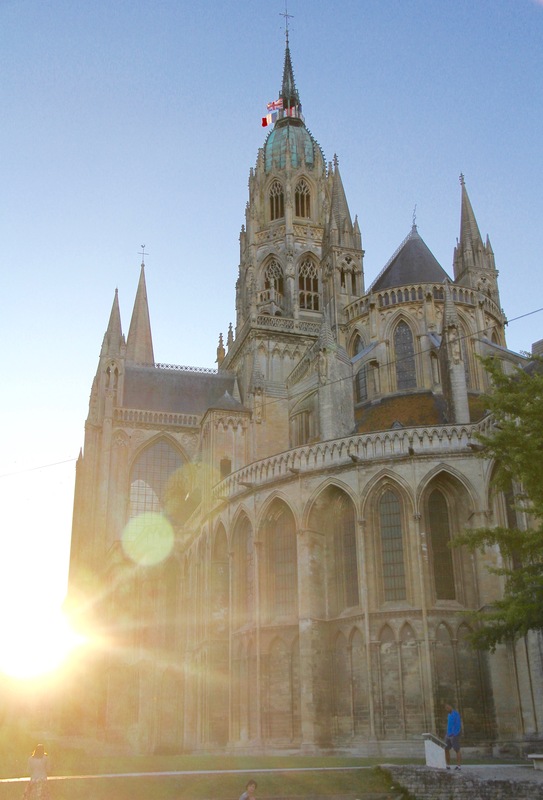 As the sun began it’s descent over the English Channel, we returned to Bayeux. I almost couldn’t absorb everything I’d seen that day. The history had unmoored me. Emotionally, I was overwhelmed. After six days of keeping all the King Louies straight, figuring out the French Revolution, and seeing the progression of art from Middle Ages to Post-Impressionism, this walk through 1944 jettisoned me to a place of personal proximity. We’ve lived around some wonderful WWII veterans, like Henry Stringham and George Glade. My children have been in their homes and heard their stories. Henry was part of the United States Air Corps and safely landed his disabled plane on Iowa Jima. An act that earned him the Flying Cross. 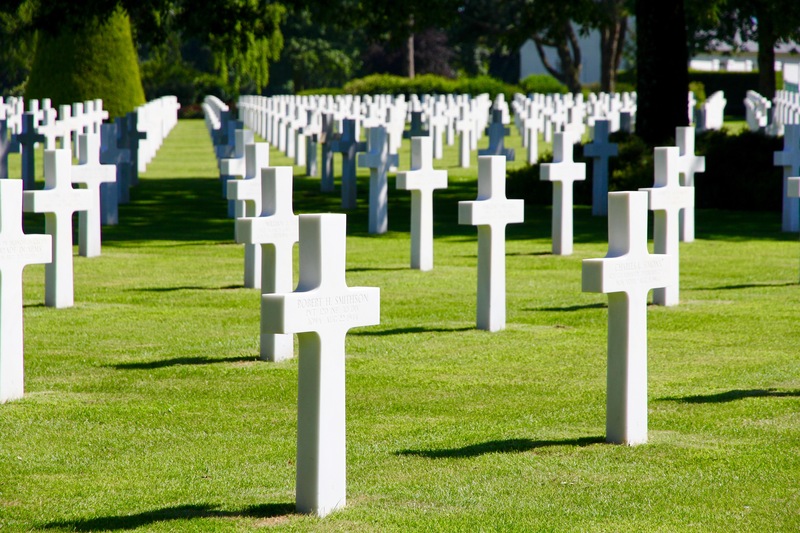 Our generation and our children’s generation will be the last to know the Greatest Generation. Will we forget? Will we forget what they gave? What they learned? Will we continue to tell their stories? If we were asked to “stand between our loved homes and war’s desolation” would we do it? I hope we would. I don’t know what it is to have my freedom threatened. I have known so much ease, so much choice, so much ability to do with my life whatever I want. But along those sacred shores I felt the power of collective sacrifice. Certain spots on the earth are made holy not just because God has been there, but because a true setting aside of self happened there. 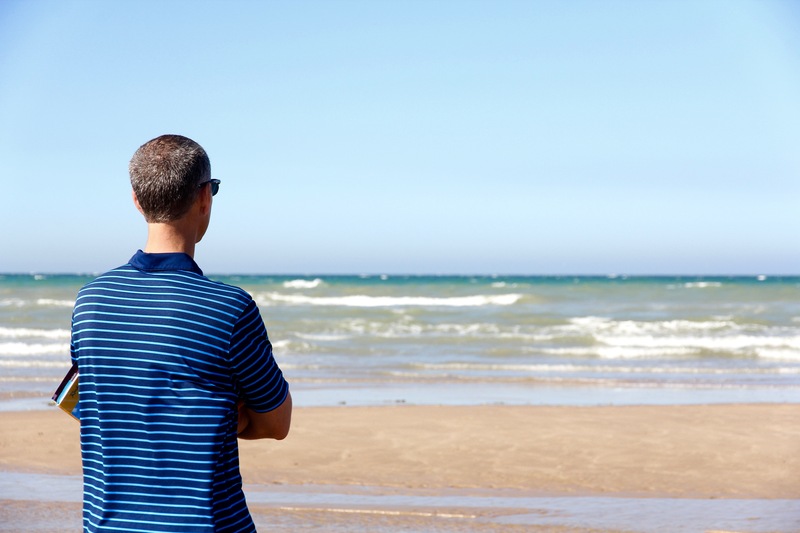 I felt that selflessness rise on the ocean breeze, watched it bend the grass on the bluffs. 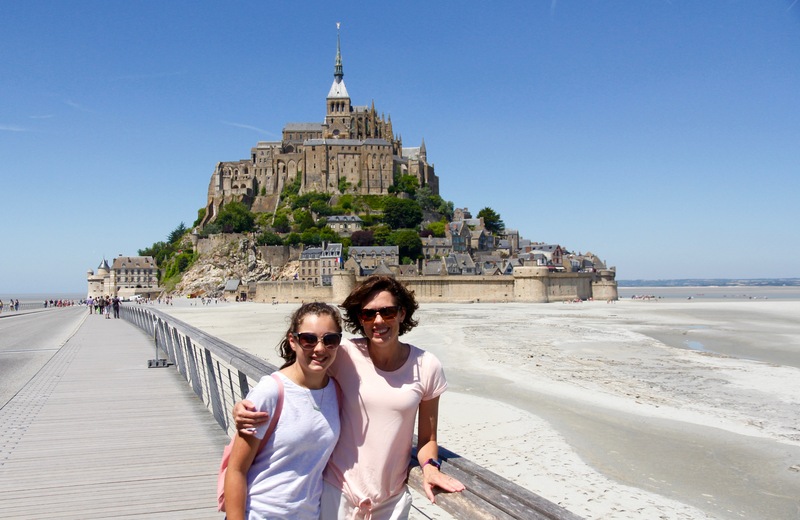 Heroic stories of Allies and French Resistance floated over and through these rebuilt towns with a soft and salty sting. They moved us to tears. They were hard to hear. But they taught us invaluable lessons. 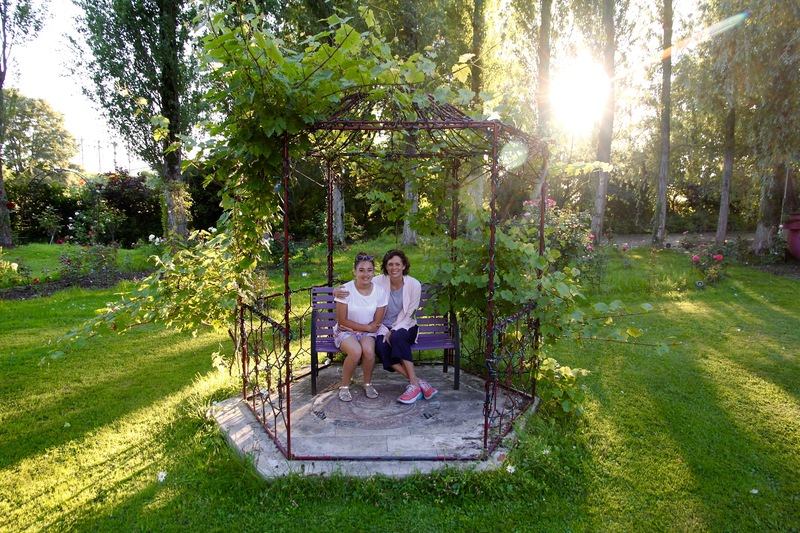 Evening light in the Château gardens was too lovely not to capture. 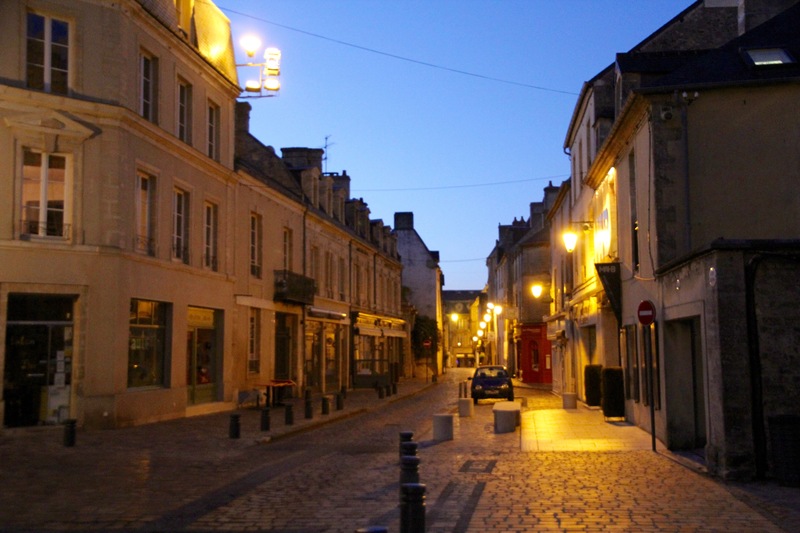 We spent the rest of the evening eating dinner in Bayeux and exploring the old town after dark. 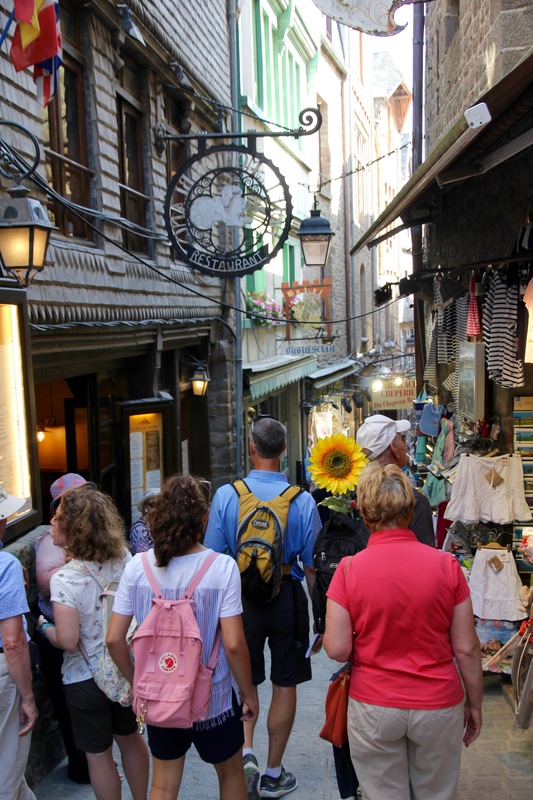 I loved the cobblestone streets. The quiet shops closed up for the night. It was like we had stepped back in time. 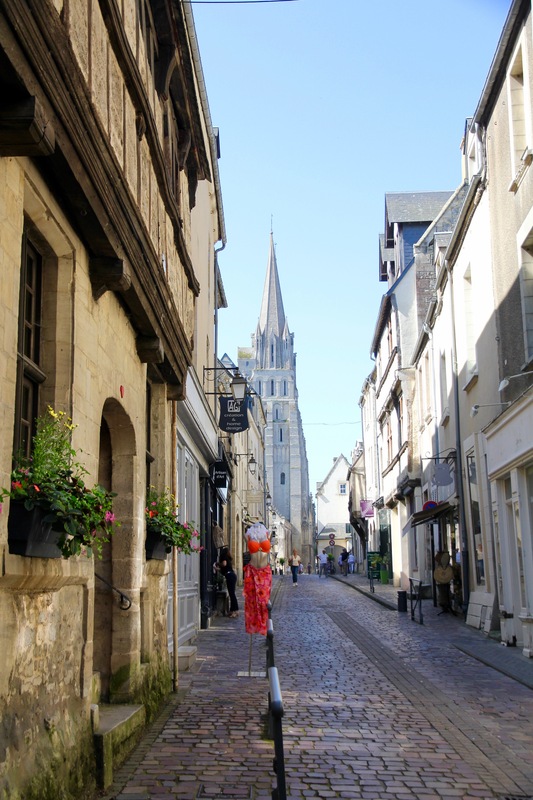 The next morning we said goodbye to our Château, got breakfast in Bayeux, and walked through the market. 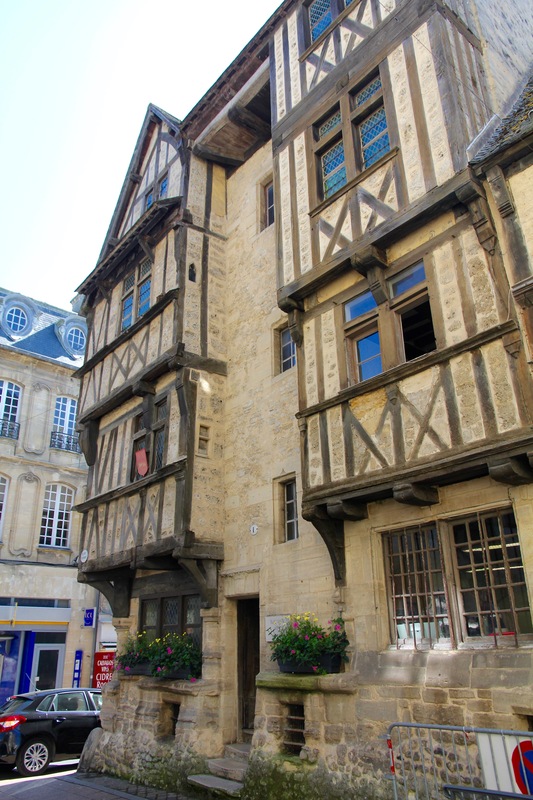 This is the oldest house in Bayeux. 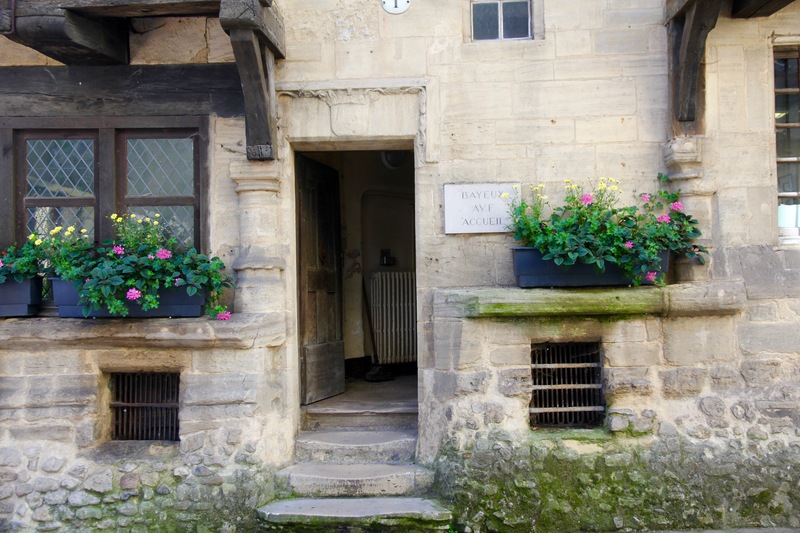 Dates back to the 13th century! I loved the half timbers and flowers. 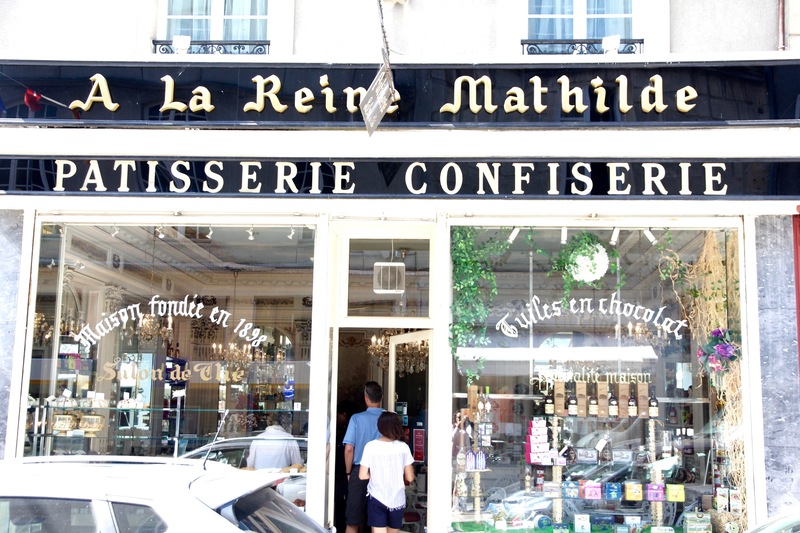 Breakfast here at this patisserie. 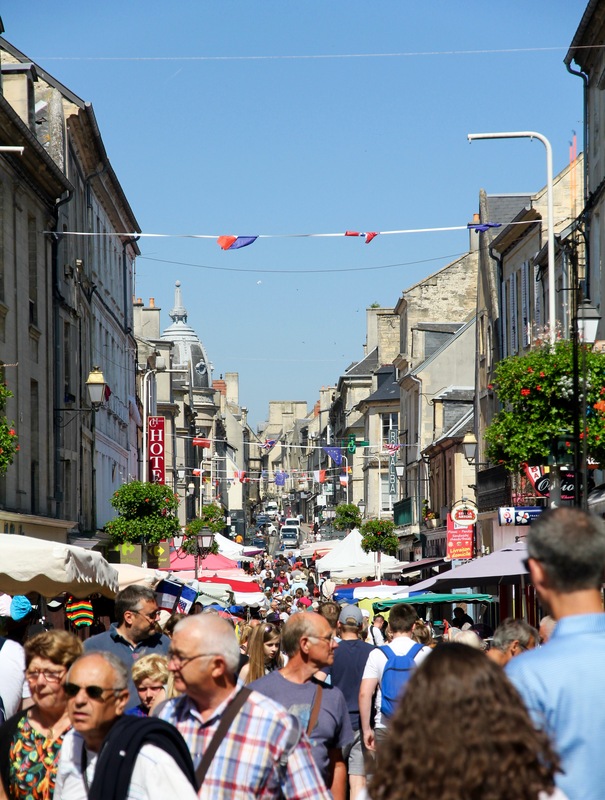 We walked through the Bayeux market and found some small gifts for the twins at home. Before driving on to our next destination we picked up sandwiches. Our standard jambon et fromage. Ham and cheese. 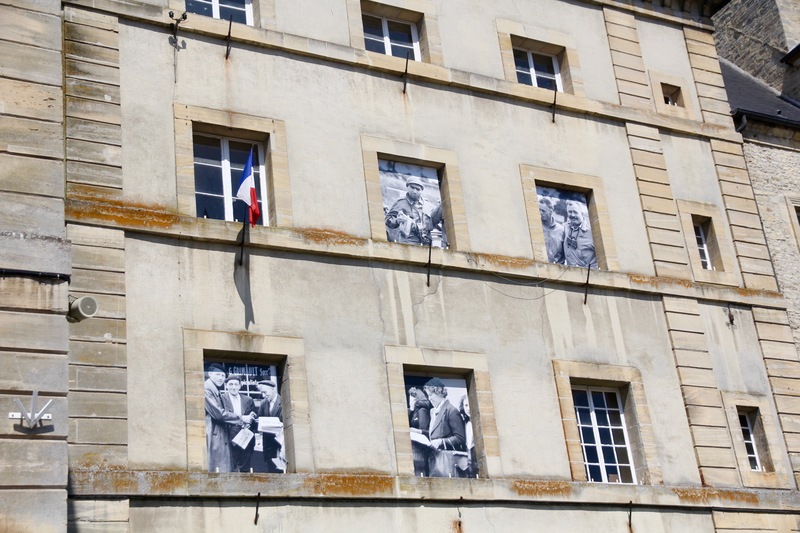 Some of the buildings in Bayeux not only fly Allied flags, they have old black and white wartime photos hanging in their windows. Worth stopping to look at each one. Good thing Eliza waited to get braces until we got home. She never would have been able to bite into all those baguettes! And every day? 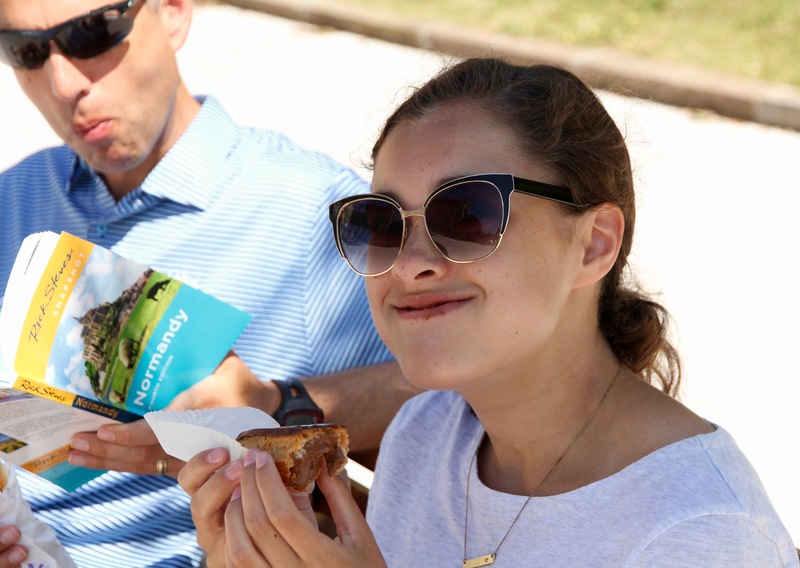 A chocolate eclair for her. She couldn’t resist. She ate every bite of every single one. 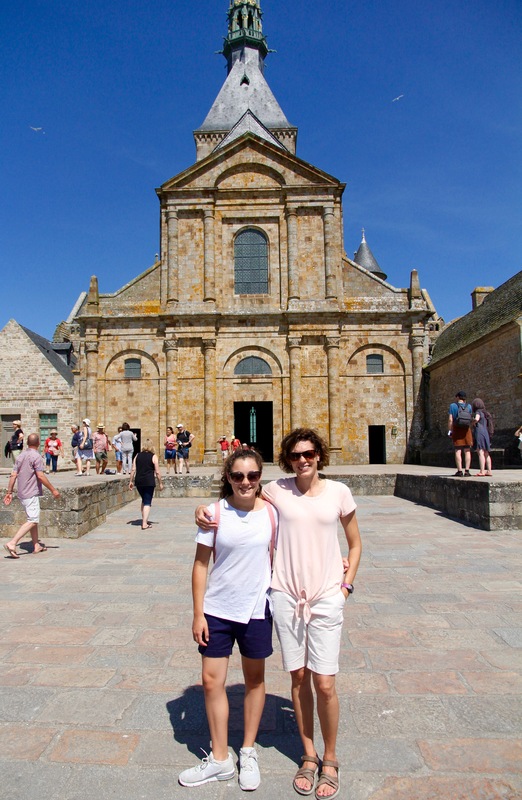 Our final stop in Normandy was Mont Saint-Michel. I’ve dreamt of visiting this place for years. And I’ll tell you right up front: the best time to see it is at night or first thing in the morning. It is never closed. 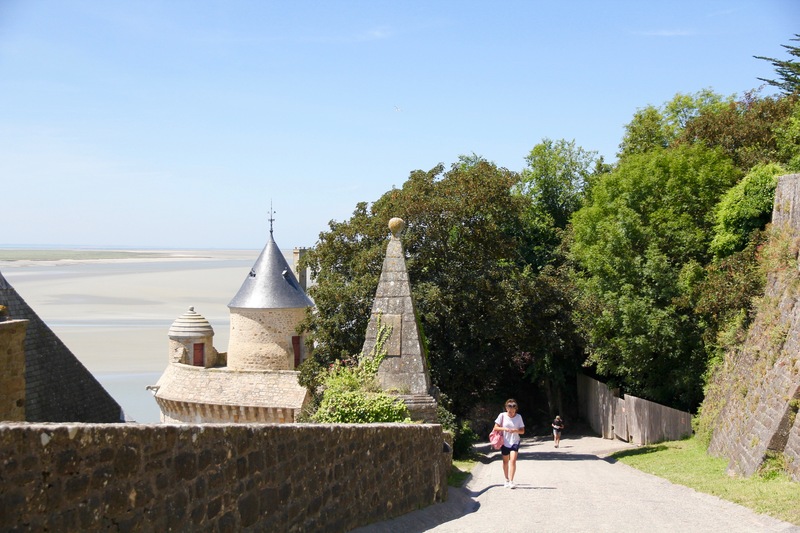 In fact, you can actually stay in the tiny village on the mount, which we would recommend, and that would enable you to see it surrounded by water with the tide in. My only regret is that we didn’t see the tide come in and we didn’t get to see it lit up at night. But our flight was leaving the following morning and we had to drive back to Paris. 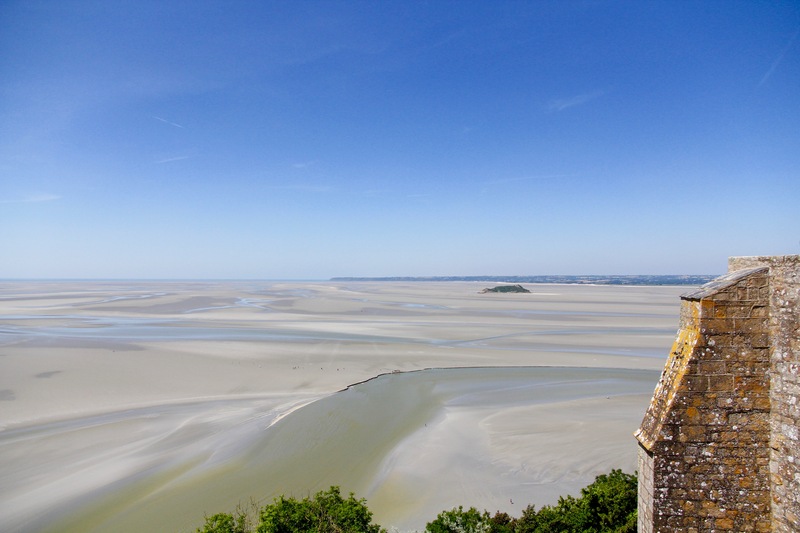 Mont Saint-Michel has a long and significant history, dating back to 708 when a sanctuary was first built to Saint Michael the archangel. 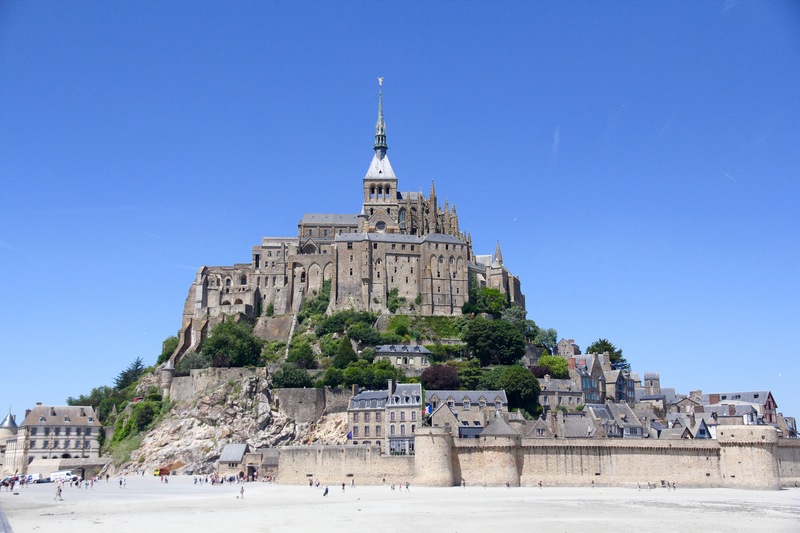 Later it became an abbey for a Benedictine Order, a stronghold for the Hundred Years’ War, a prison after the French Revolution, and once again, an abbey. It’s still an abbey today. This wicked-steep slide allowed them to transport items up and down on sleds. 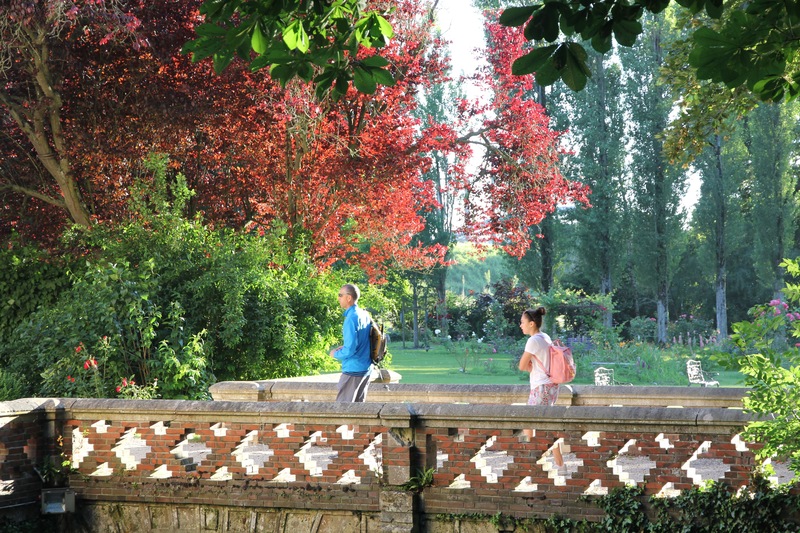 Over the centuries, a little village with shops and homes grew up just below the abbey. This is the chapel at the top of the abbey. 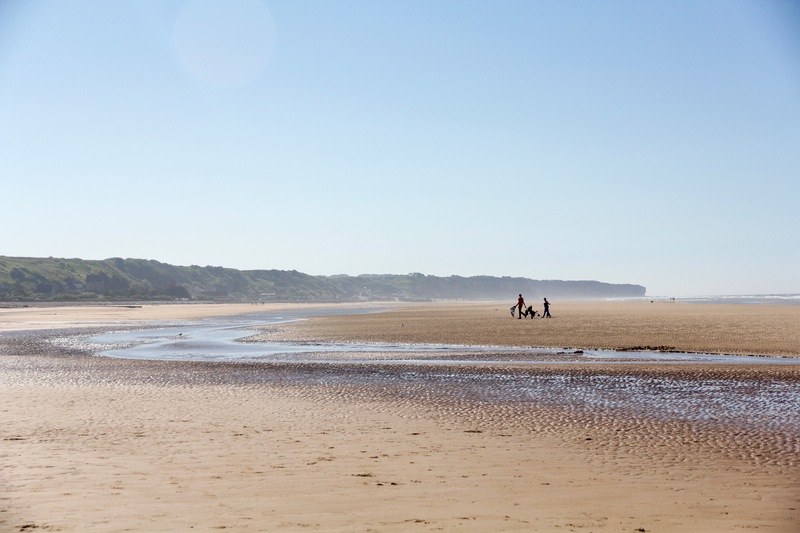 Would you believe the tide comes in faster here than any other place on the earth?? It comes in at 18 feet per second. Sounds unbelievable. But that’s what we read and what we were told. You don’t want to get caught out there on those silty plains exploring when high tide is on the move. See those tiny specs of people trying to make it out to the island? We were’t able to stay around long enough to see if they made it back in time. The shops are kinda kitchy and old but fun to walk past. 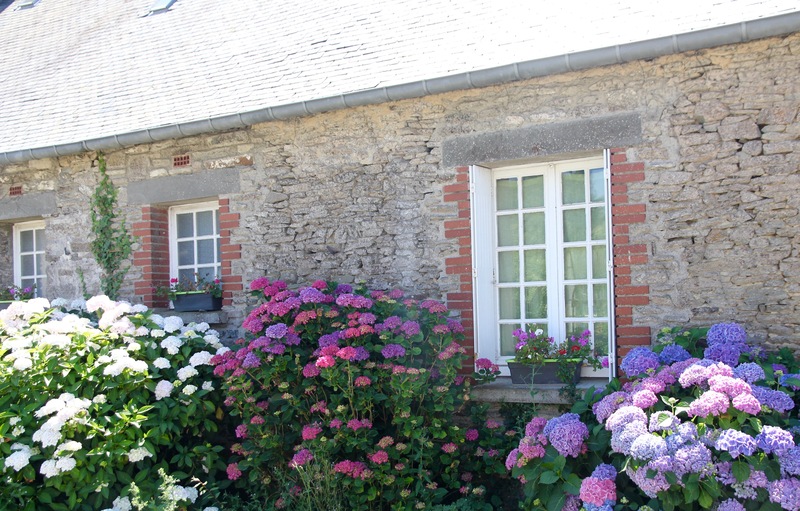 And that is our Normandy adventure. Mostly what we saw and where we went. But also what happened inside of us. And to me, the journey of the inner self is what makes the most interesting and important stories in life. 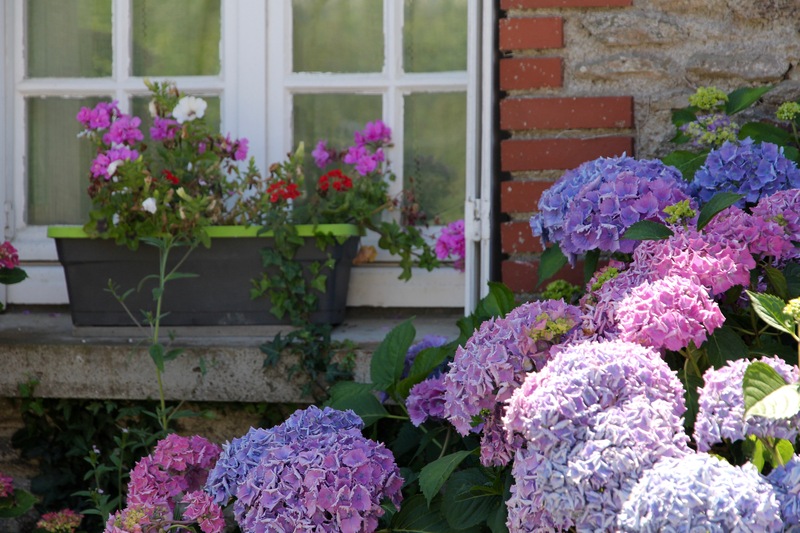 Lots of homes in the coastal towns have the most gorgeous hydrangeas. I wanted to stop every few turns in the road to take a photo. 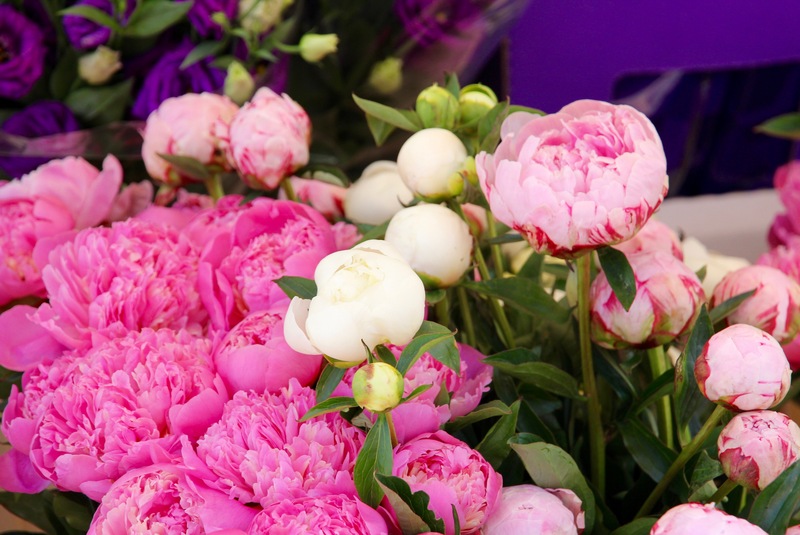 I thought how these purple, pink, and blue blooms represent beauty for ashes. Emblems of restoration. Liberty is a delicate thing. It needs protecting. It needs remembering and holding. And too often in history it has only been reclaimed through sacrifice. How very precious is liberté. Breathtaking. Thank you for taking the time to write and share. My dear friend, thank you for sharing your thoughts and insights. 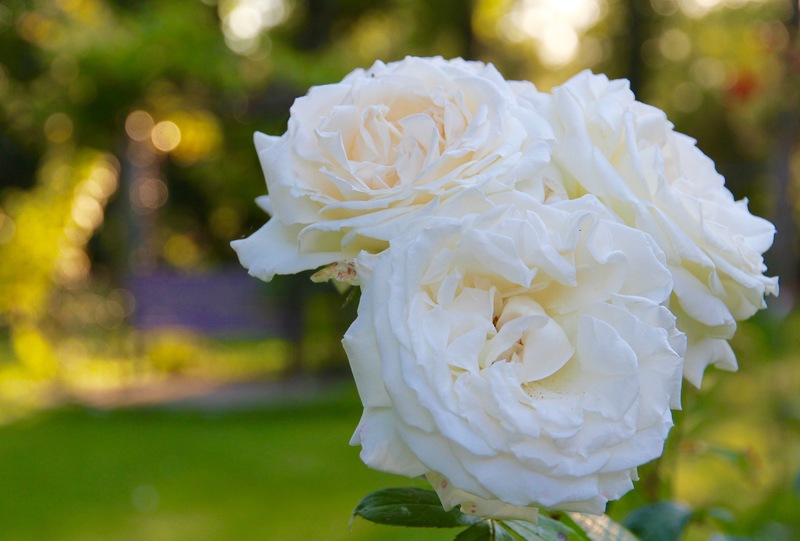 You and Doug are passing on to your kids such deep compassion, gratitude and reverence for life. 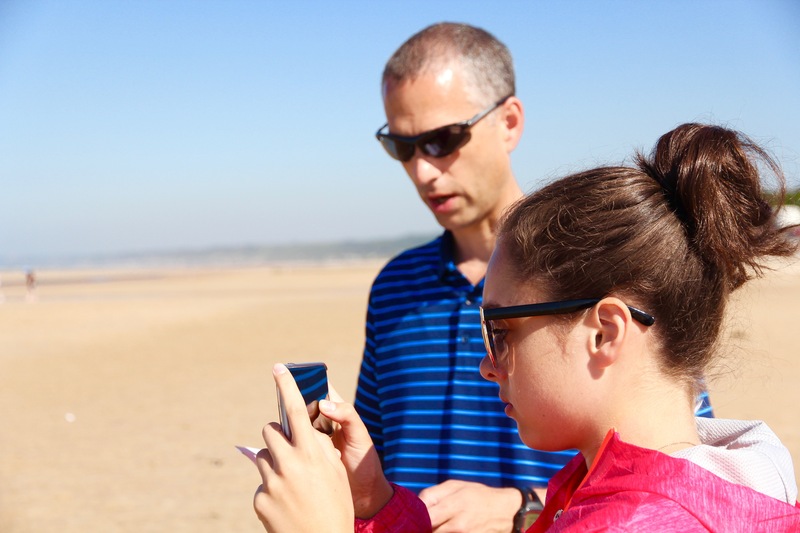 You care so deeply for people and are connecting your kids to the past in such a meaningful way. 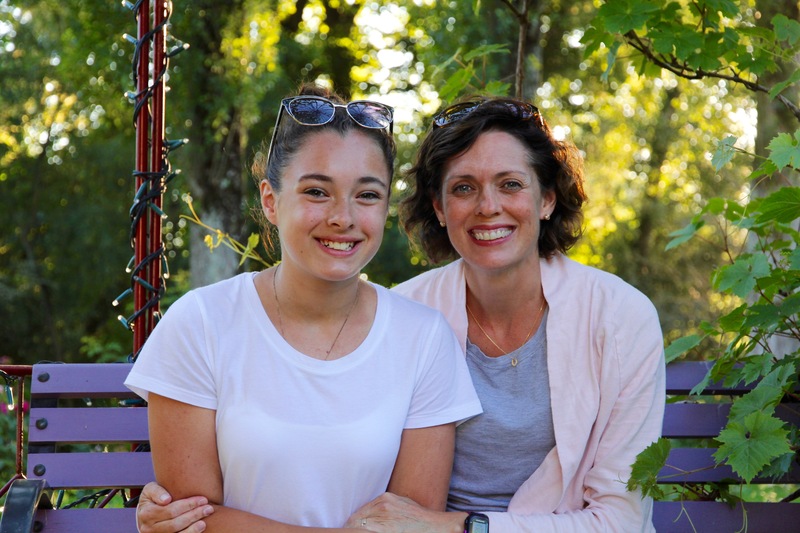 What an amazing experience for Eliza! The pastries. 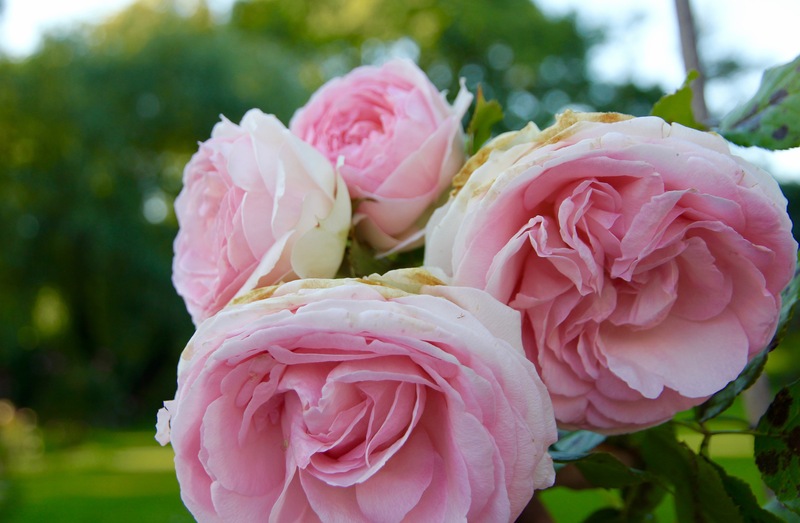 The flowers. The architecture. The history. So beautiful. 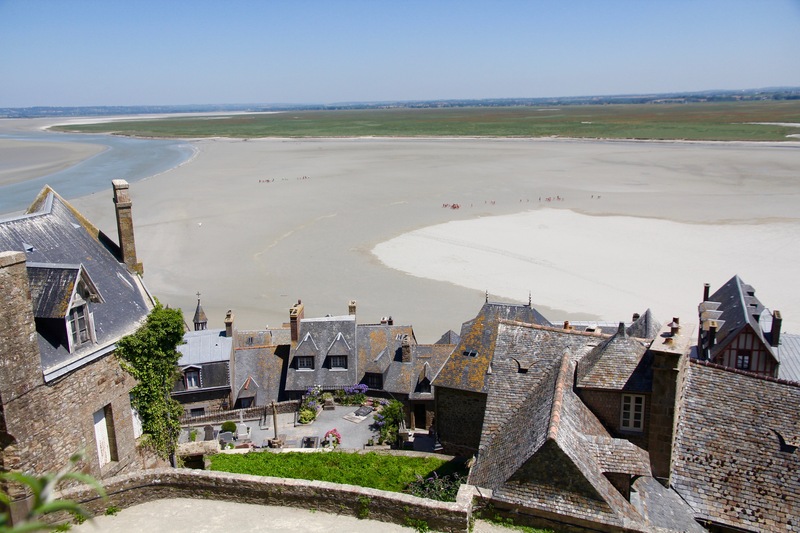 Mont Saint Michel too!